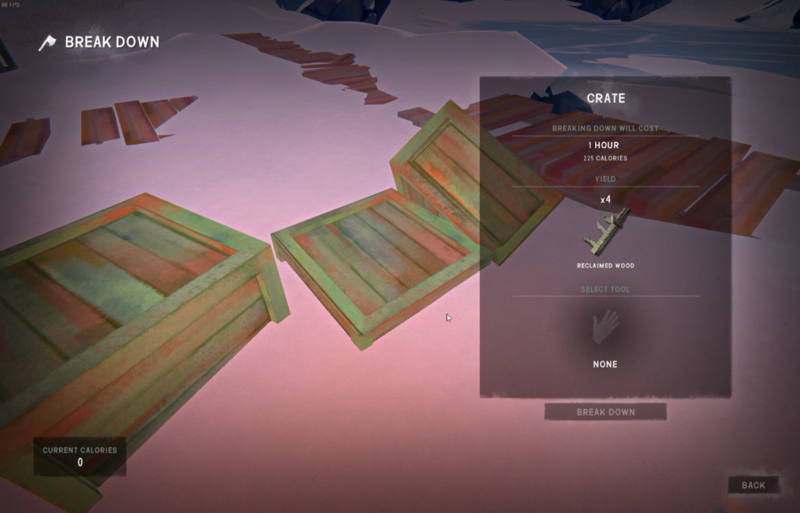 Health bar looks a little bit better - more than 30%. I'll need to be careful today though and not lose too much before next rest. Out collecting sticks and I am ambushed by 2 wolves. 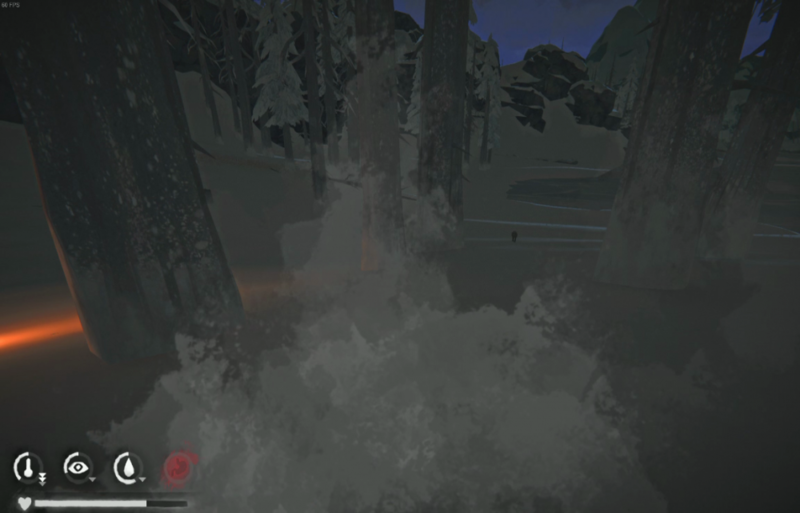 I strike a match to drive them back as they were between me and the forge and did not think I could outmaneuver both of them in the fog. I still have 3 cans of food that I didn't want to open without a can opener but it's looking more likely that I will have to smash them open. Over to the bunkhouses with a torch to break down some more firewood. 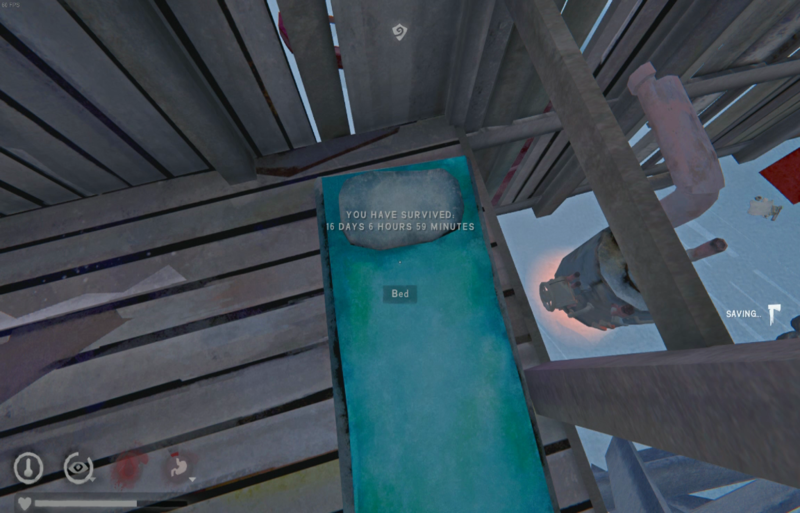 Alternating between the crates and nearby scrub bushes to stay warm but also use the temp meter efficiently as well. A rash decision I continue on without realizing the peril of my situation. 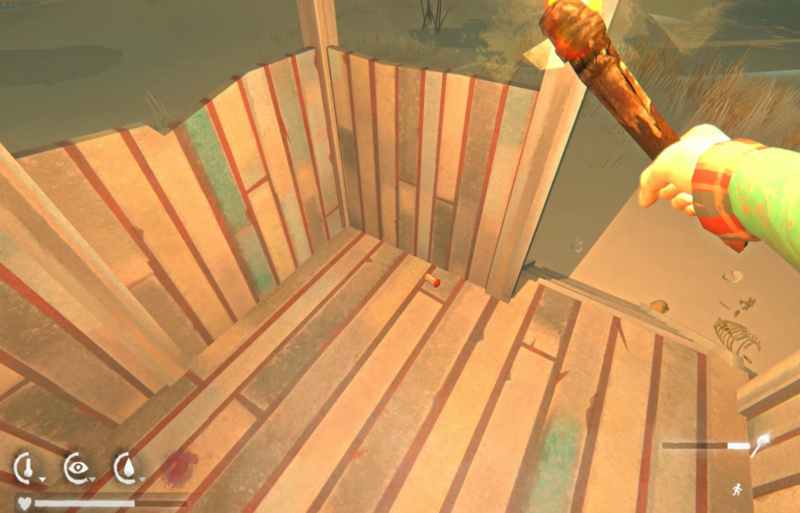 I torch walk collecting sticks all the way to the Overlook. 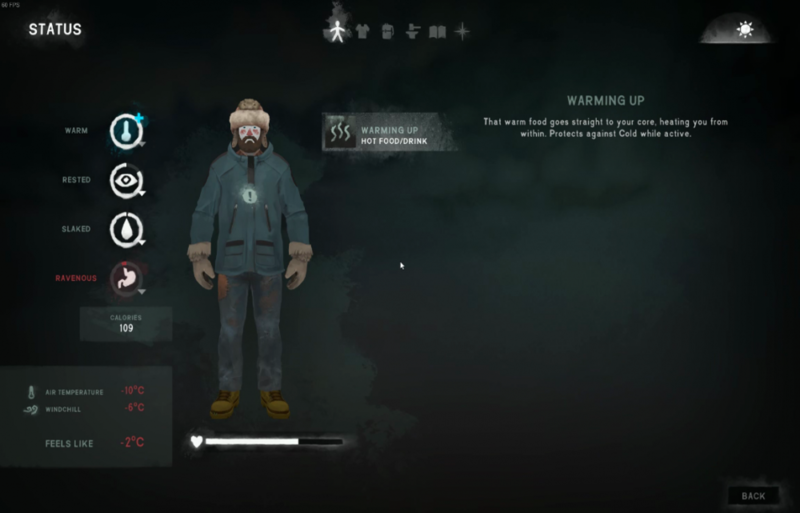 find the vest and some cedar and start a fire next to a fir log to warm up and harvest. Health dropping to around 15% but pay no mind to that. Exhaustion now approaching 1/8th. A wolf jumps a rabbit as I am collecting reishi so I am able to skirt around her. Day 6 and it all comes to an end. There is so much here still to try. Unlucky! In hindsight, it seems like your determination to get home killed you. 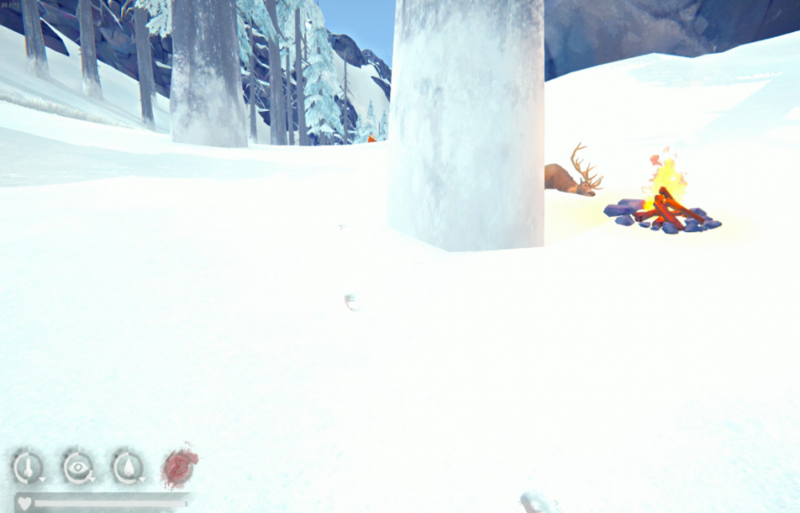 If you'd stopped in that cave to warm up, you might have made it. I believe cold kills twice as quick as tiredness. It's a great challenge though and thanks for sharing! 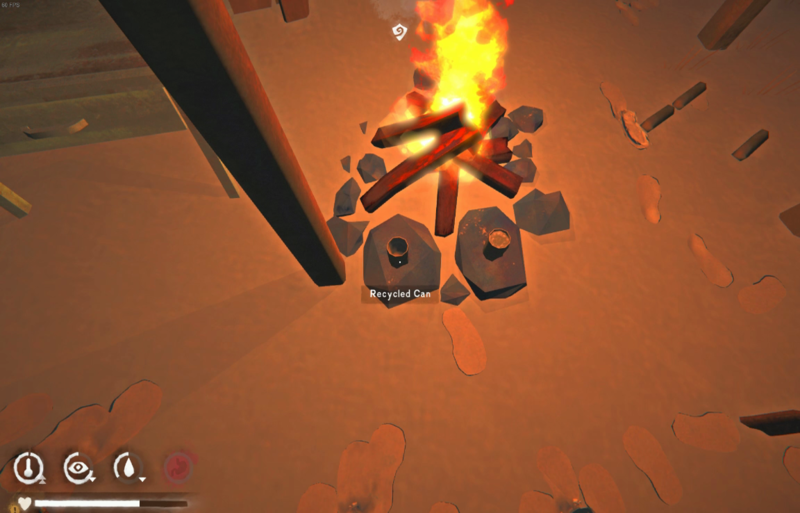 The Keg at least has coal around but if you don't get a bedroll I don't see you making it long enough to make your own. But that's the challenge! Good luck! Hang on, no hammer, no party! So you're trying to survive the Keg on Interloper with whatever random clothes turn up and not much else. 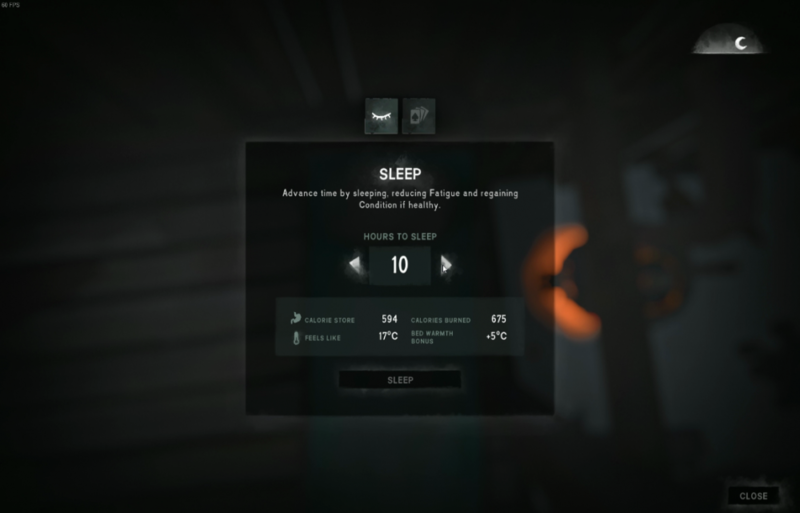 Even if you can stablise some warm sleeping arrangment, the worsening weather and clothing condition will soon make things untenable. So much is down to the chance of weather - get one blizzard when your due to collect wood and you're probably done for. Still. Challenge. Good luck! I believe cold kills twice as quick as tiredness. 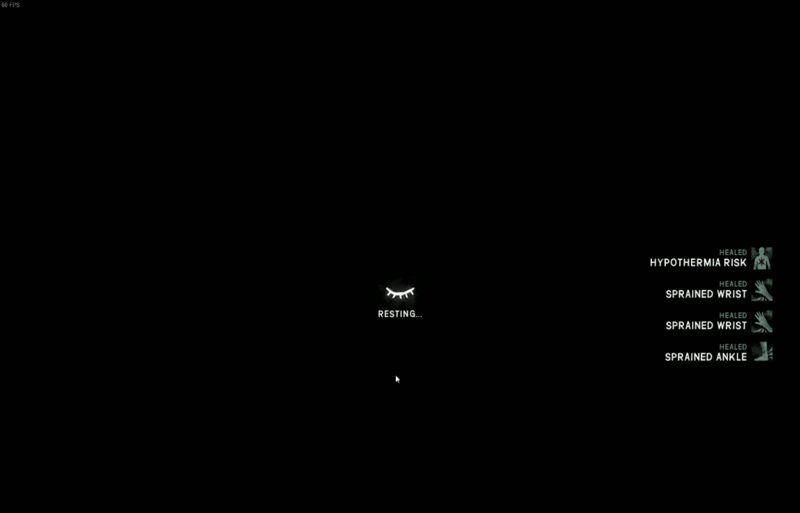 Your welcome, I just had to add in the bunny doing a backflip, it was a funny slo mo. 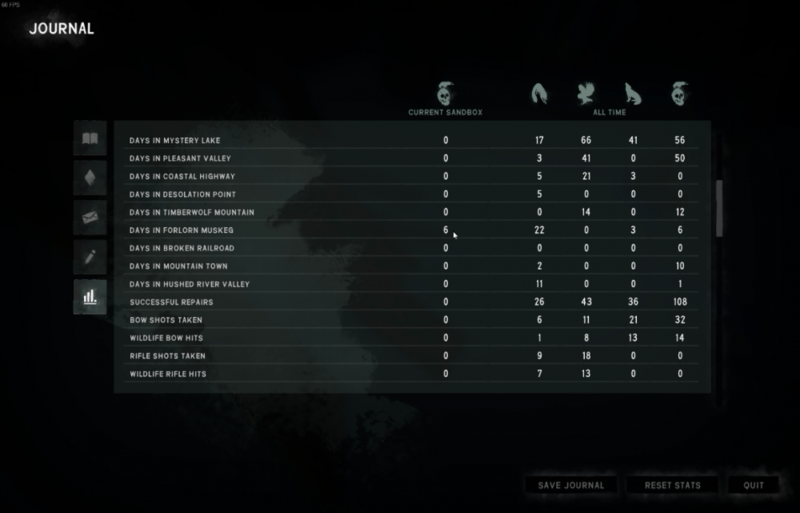 I've been trying to screen capture all my runs. Keg 2 is coming soon but I forgot to capture Day 1 to Day 4 so there will probably be less info in the story for those days. Yes, I'm sure I could have made it with a warm up break. I recently went an all nighter blizzard (maybe 20+ hours) exhausted in the Poacher's Camp and I didn't die. I had collected 125 sticks and 8 coal that day so I thought I would have a good stockpile of fuel but it was all gone after that. All I had to show was a ton of water melted during that time so not a total waste but disheartening after all the work collecting. Yup, no bedroll for the Keg Stand. It's sleepy time at Spence or maybe a snow shelter as the only options. That and the random weather will play a huge part. Did not record this video for myself to review and write this part of the story. If recollection serves me well I spawned at Waterfall at midnight and retreated to the cave to wait for warmer weather and light. It would have been good to bag some rabbits but it was too cold for even short foray's out. The first few days in FM are similar as there are short trips out for sticks and longer missions when it's not too cold to search for gear. 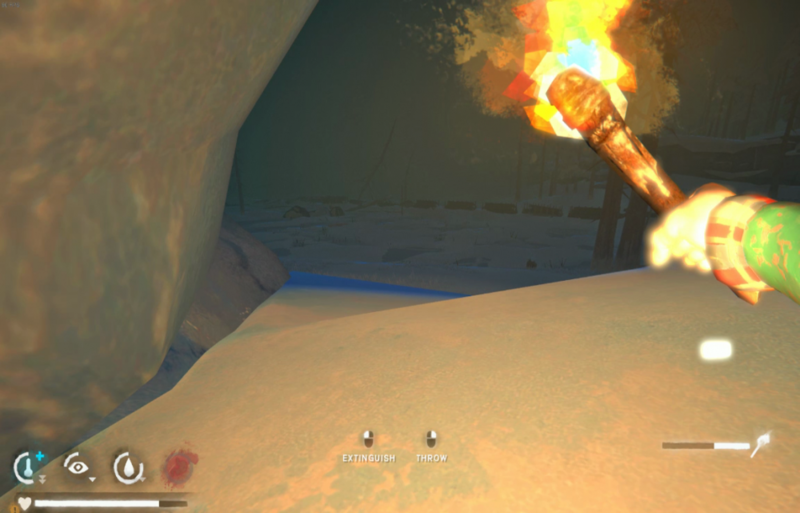 I make a few torches from the rest of the fire and take the guts and hide to cure at the Bunkhouse Cave. Torchwalking back to Spence the wind comes up and it blows it out. FLT is -2C so I wait to light a fire and warm up by passing time in bed which gives a +5C bonus. I alternate warming up and breaking down shrubs which yields an approximate +2 net stick benefit (20min breaking down plus 15min at the fire warming up while crafting reishi). 0% stamina so I smash a dog food and lose 16% and top up with some cattails. Fire stoked to 10 hours and off to bed. My wakeup time each day I try and time to be afternoon. Today it looks to be about 2pm which is perfect. There's some time left on the forge so I make some water and reishi. FLT is -6C and that will even go up a little bit more as it approaches dusk. From 4pm to night is what I consider the "golden hours". If there is no wind or blizzard it is almost always 1 down arrow on temp and when going on supply runs you can be outside, exposed for about 2 to 3 hours I would estimate without significant hypo or condition loss. Add in a warming drink and you get around 40min of temp holding at max as well while out until the temp bar starts dropping (not sure of the actual formula for a warming drink or how much it adds). I loop across the ice towards Poacher's and then collect sticks and reishi below Overlook before heading back towards High Blind across the islands and ice. 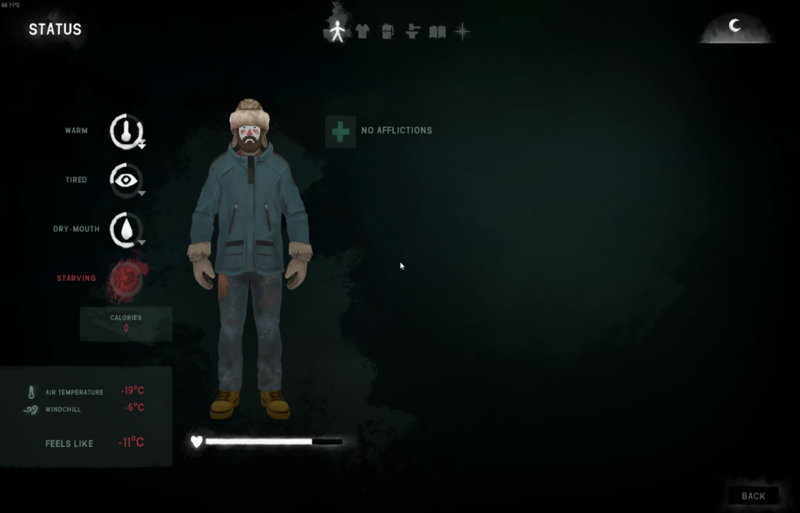 I check into a carcass, previously harvested just for the meat but with 59% hypo I move on to the island with the shed and fire barrel where an untouched carcass is at the top of the hill. 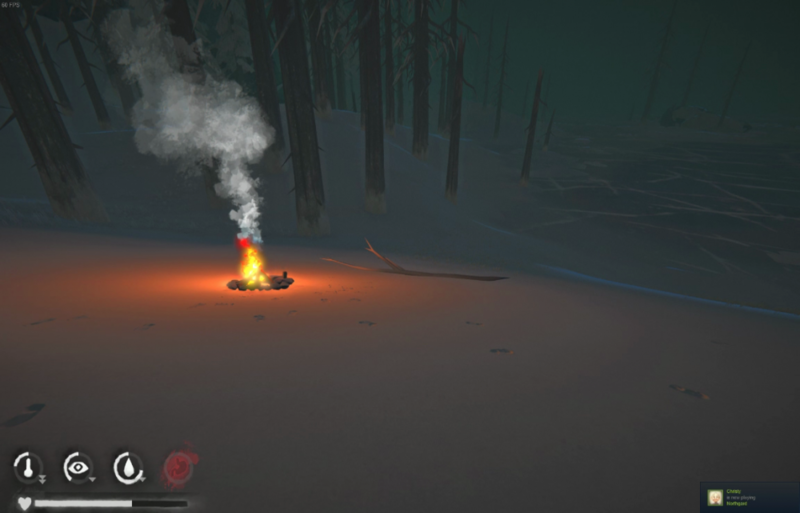 I strategically place a fire in reach of the carcass and a cedar log so I can take both. I drop two 0.5kg steaks on the fire after warming up a tea which give 25% on the temp meter. Take a gut and drop it quickly on the ground when done. I go back for the final 0.5kg. I take a torch from the 21min fire left and walk into the fog that has rolled in, like it does every night, and head to Spence. I dump most of the 45 cattails in the box by the bed after prepping a few teas and boiling some water. It's just after midnight which works well with my planned daily schedule. The fire lasts longer through the cold morning and I need to take advantage of any warm part of the day I can here. 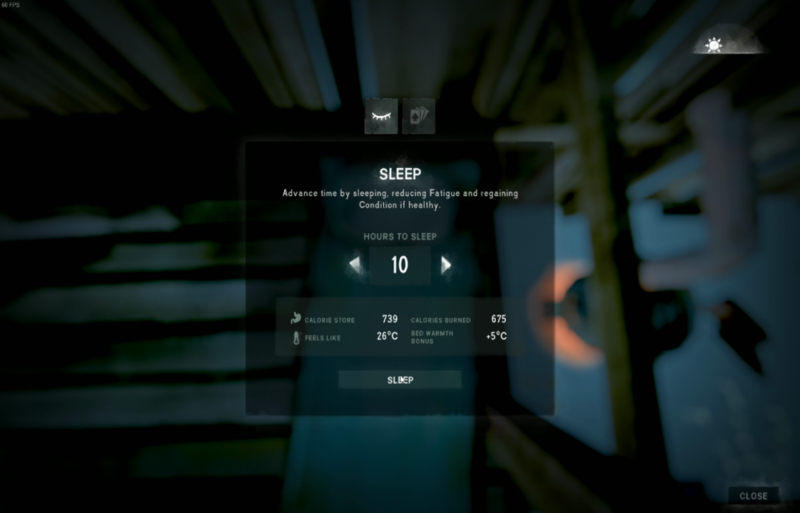 10 hours of sleep should help my 55% condition. I drink the last of my water as I wake up thirsty, all the H20 and one tea gives me is about 1/3 full on the water meter. I have not been able to provide a plentiful supply with just one can. I have never found a pot spawn in FM so I am hopeful we can track down at least a can opener for the last dog food. Condition looks to be around 85% or maybe a little higher. 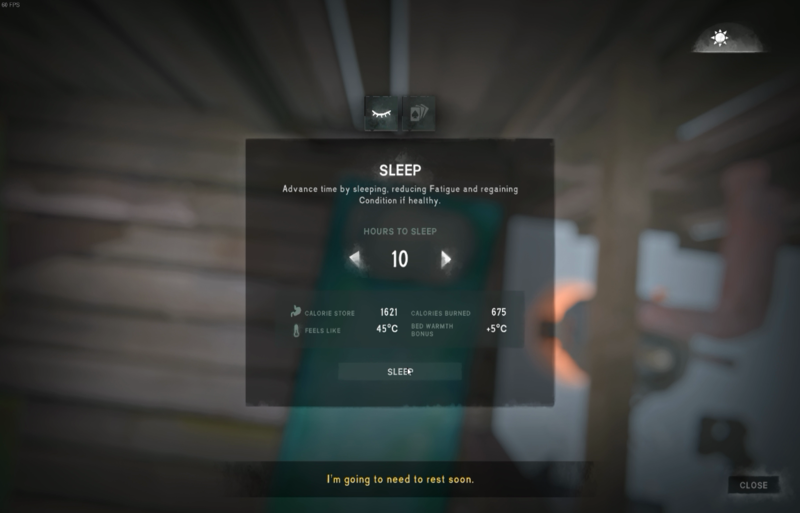 2 hours and 47min on the forge 10 hours of sleeping from 10 hours and 38min when I went to bed so it must have been a cold night. Almost 20% bonus to the fire in those 10 hours. This will give me a chance to make some more water supply. Before noon it was 3 down arrows after noon now is is -13C and 2 down arrows which is markedly better for collecting and breaking down fuel. 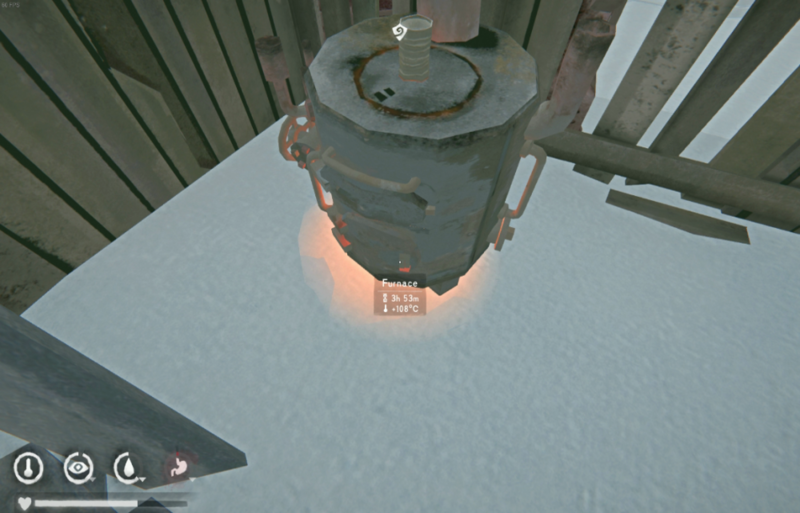 One shrub and one branch only takes 50% of the temp meter. With 30min passed I go collect my 0.5L of safe water. I've been sprinting a lot today for some reason so I sleep for an hour and awake around 5pm with temp very nice. 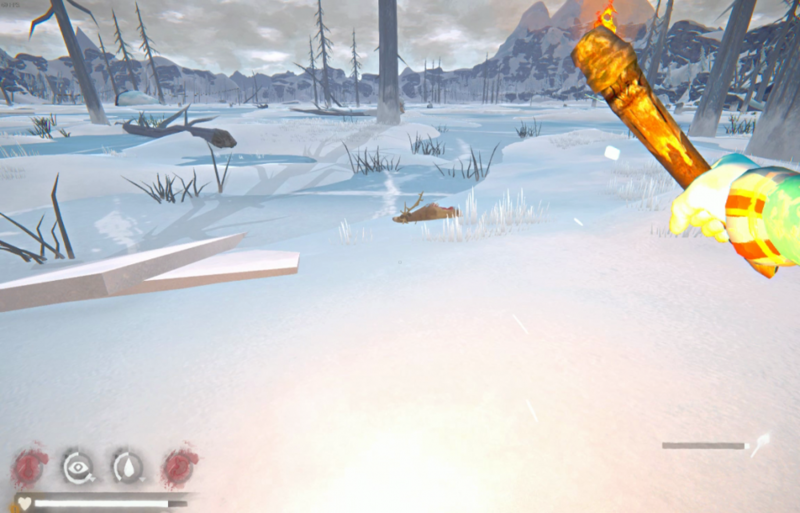 I pick up the 2nd deer hide and guts along with some torches. FLT is -3C but I hear some birds above, these crows could be a bad omen. The wolf is far away from the cave and I am able to drop my smelly cargo without incident. On the way back I take advantage of no wind to break down boxes at the Bunkhouse's. Should have brought my can to make more water so I am not maximizing my fire time here. I break down 2 shrubs for every box to maximize my temp meter warming and cooling. Torches take me back to Spence and I prep for another night/morning of sleep. 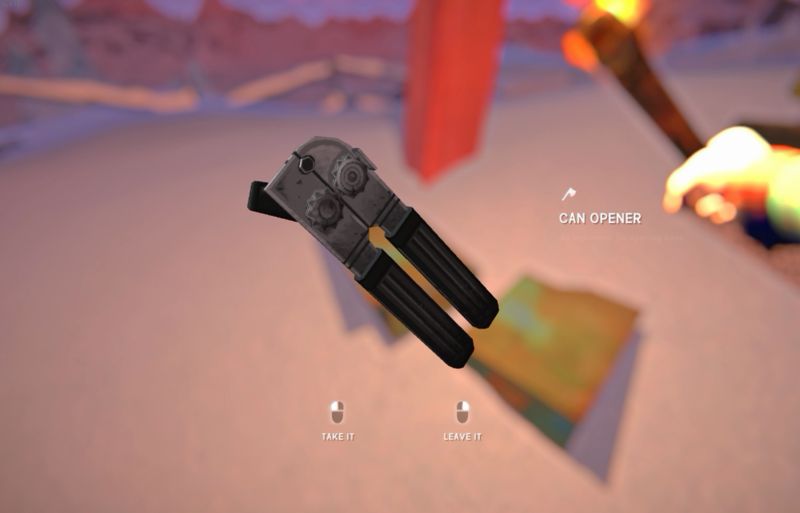 Trek to Shortwave tower and finally get the can opener I desperately need to make more water. I bag all the Marsh bunnies, harvest all the guts and hides and drop them in the cave next to the deer who fell through the roof of the cave (guaranteed FM spawn?). I cook and eat all the bunny fillets and deer steak and head home with a more than full belly as I do not want to be smelly as I drop off March Ridge. There are almost always 2 wolves between this area and the train cars and are hard enough to dodge without attracting undue attention. The trip back takes it's toll. 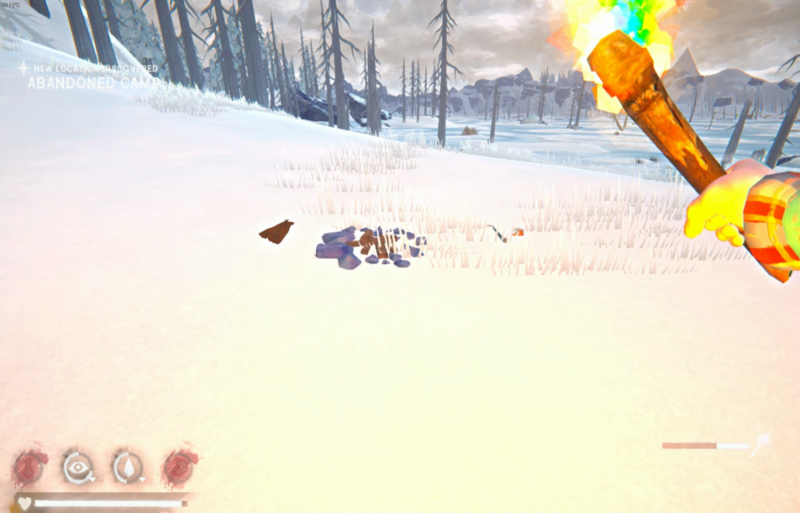 One wolf below Marsh had to start a quick fire to scare it away then two wolves above Spence needed another fire as they were bracketing me from either side. Frostbite and hypo risk all pretty high after the cold walk back. Somehow I think this fire did not do what I had planned. 9hrs 40min fire and 10 hours sleep I usually wake up with at least an hour to spare. For some reason this time the fire is out. 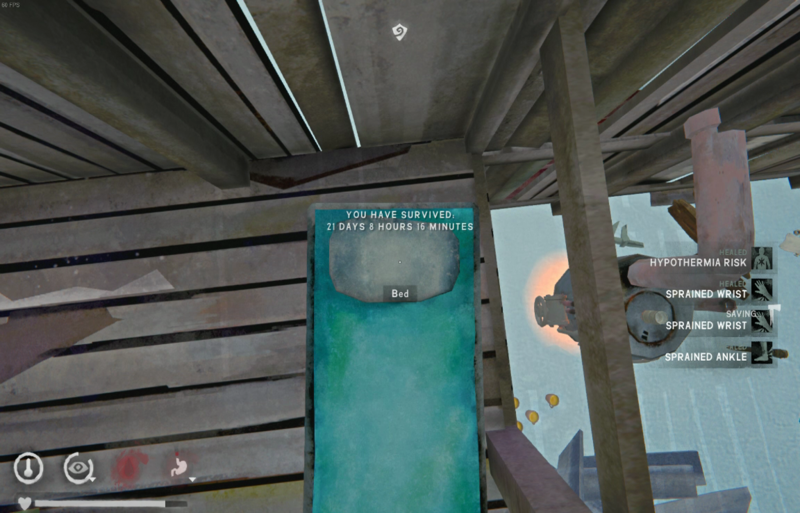 Bummer, another wasted match. Forgot to record these days. 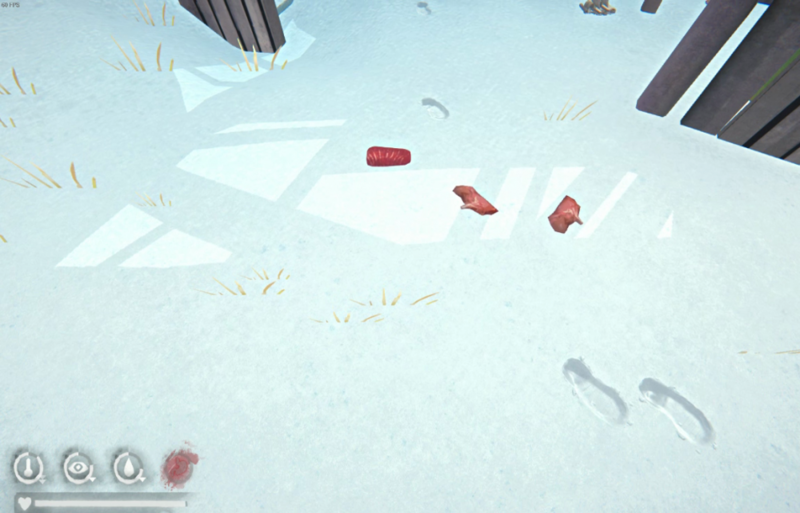 Bagged a few more rabbits from overlook and dropped guts/pelts in bunkhouse cave. 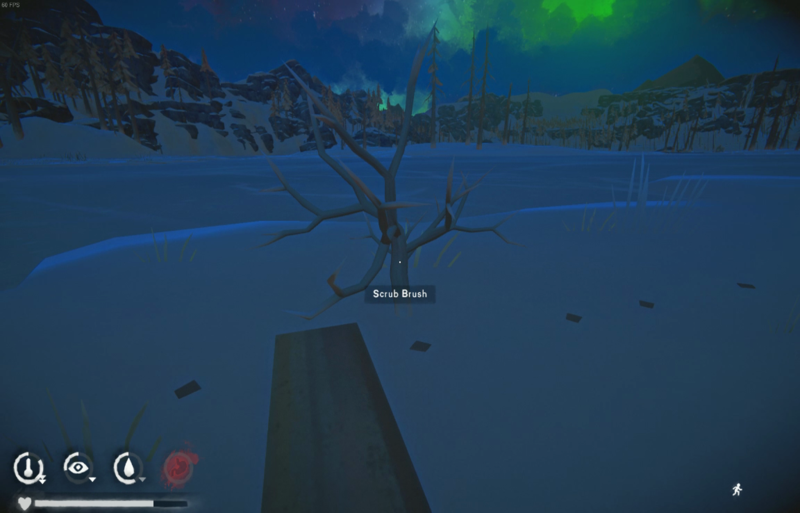 Collected sticks to wait for pelts. After 3 days began crafting hat and mitts and was successful getting these items done. Starts off cold this morning 3 hrs 53 min left on the forge. Health about 60%. I have now finished up both the rabbit hat and mitts so I can now avoid frostbite. It’s been a tough go to get these items and I should have prioritized the guts earlier in the run. 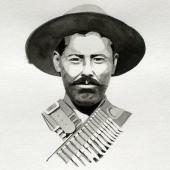 I am well stocked on water, fuel and pretty good on food. My recycled cans are getting a bit lower though, one at 23%. Hacksaw is also down to 30%. 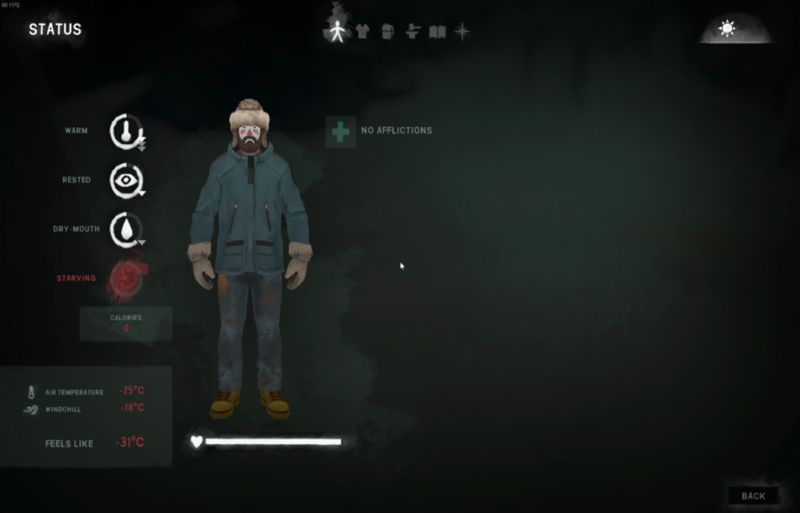 A few repairs of clothing and the 2 crafting items have left me with 43% on the sewing kit. It’s now mid-afternoon and my FLT is -2C which is perfect for some long distance collecting runs. I torch walk past the bunkhouses all the way to below overlook. I catch a faint bark and a chase begins in the distance. The deer did not make it far across the valley before being downed by the wolf. 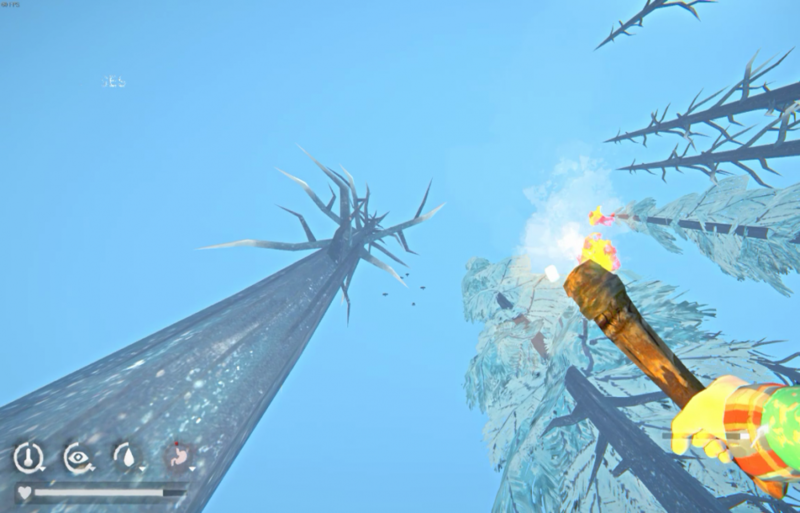 I use the distraction to wrap around behind and up to the overlook for more sticks to weigh me down, 96 collected so far. 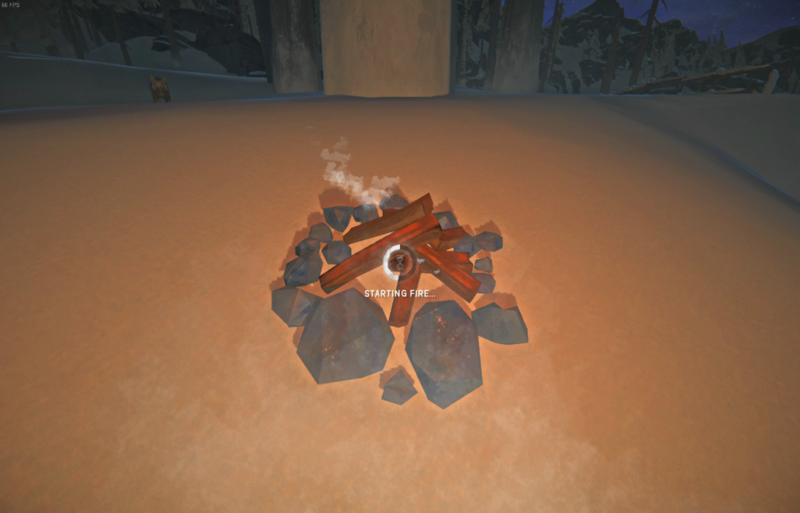 I set up a fire on the overlook with a double opportunity; a carcass and a fir log within range of one fire. 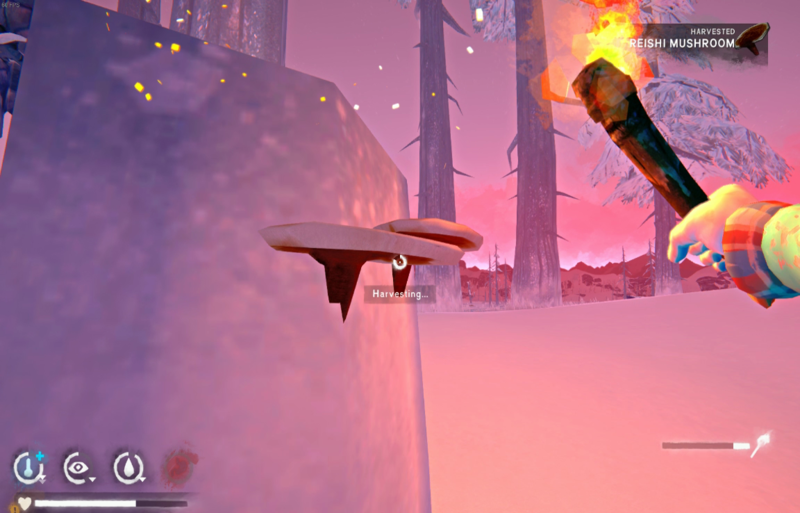 My second to last torch lights this up and I am still holding strong-ish with 4 matches remaining. After getting the minuscule 0.9kg steak I put it on to fry and collect the hide. An hour later, I have my hide and a tasty morsel. I drop down below overlook, the wind is picking up a bit and the FLT is now -13C. Of course going down the steep hill I manage to sprain a wrist and an ankle. I am long way from limping back to bed but I do have some rose hip tea so if needed we can soothe the pain. A wolf is on me, I light a couple of fires to push her back but she keeps coming for me. A third fire I stoke a little bit more and put down a RH tea to warm as I collect reishi in the area. 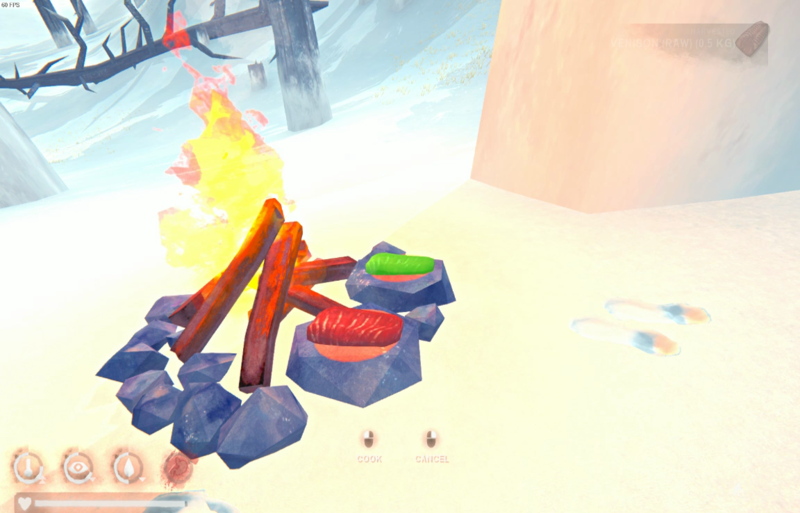 Wolfy bounces once more off the fire and I realize I have a steak in my backpack which I devour by the fire. I drink the warmed tea and it heals my hand – can I not choose which malady to heal? I gulp the second one so I can run away to poachers. 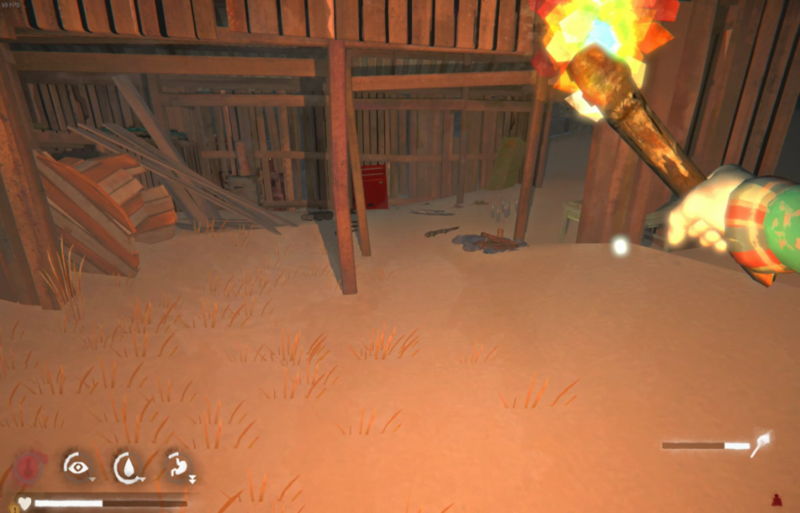 Some how even through some pretty good gust of wind my torches survive all the way to the box car. Loaded with 101 fresh sticks I can spare a few to warm up here. I craft a couple reishi’s up and then pop my one coal in the fire to accelerate the warming cycle as I don’t want to stay here too long. 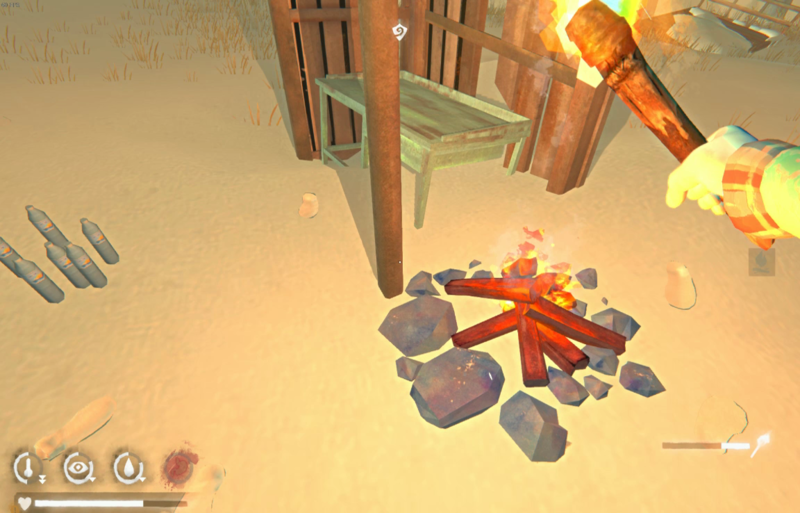 From a 2 hour fire I pull torches and harvest them for sticks until there is just 13 min left. 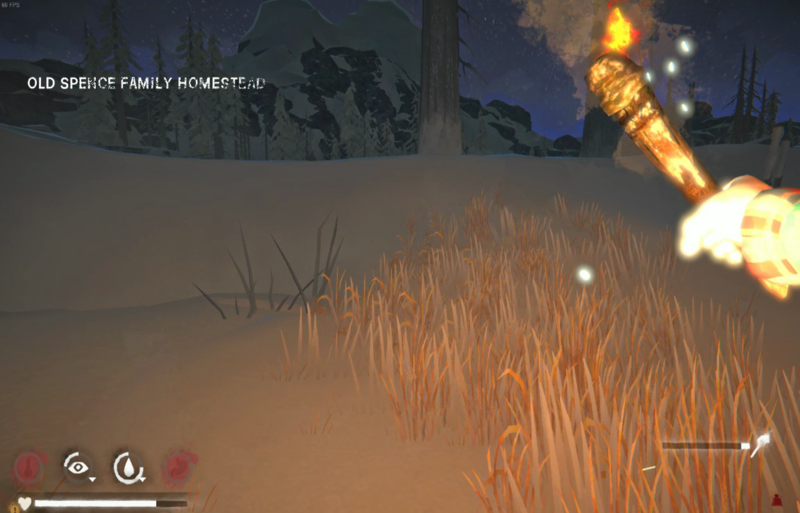 I keep my last 5 torches for the walk home, they are 45% each which will last and then some. 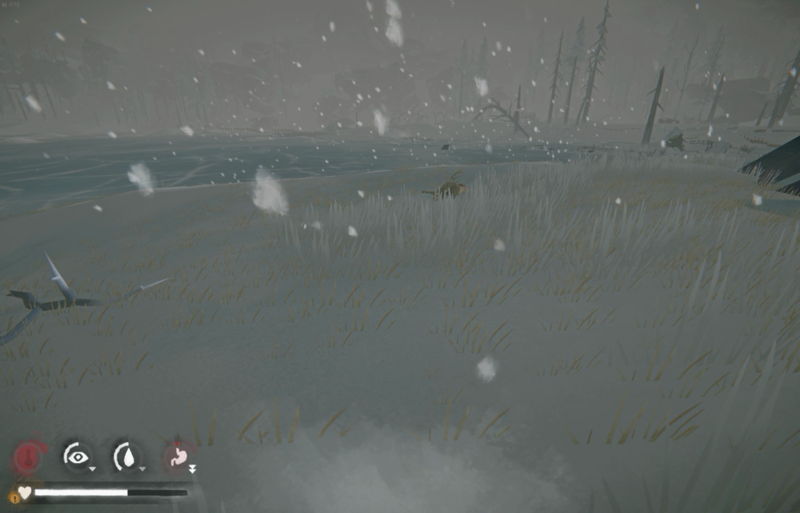 I hear a wolf somewhere on the ice but don’t see her. I follow my normal route back and the wolf gives up quickly this time so no fire needed. 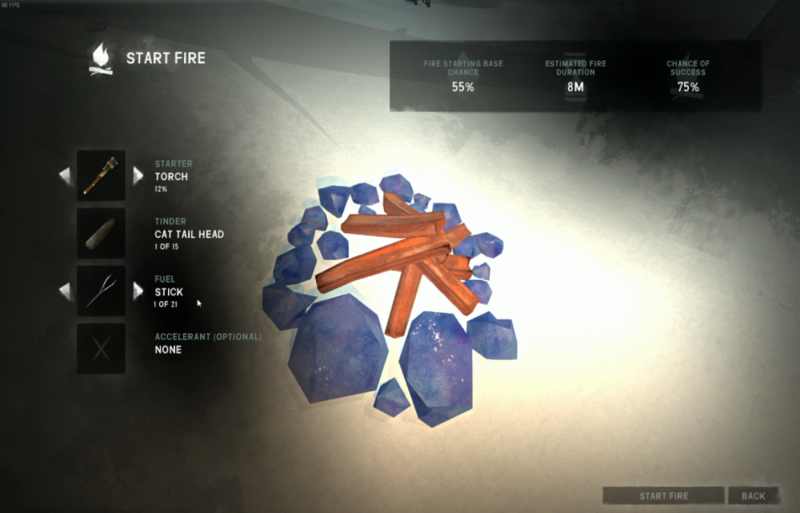 I make it back with 110 stick, 60 of them give almost 9 hours of fire. I need to put down this hide to cure so I light up one of my last 3 torches and head towards the bunkhouse cave as that route was clear earlier today. 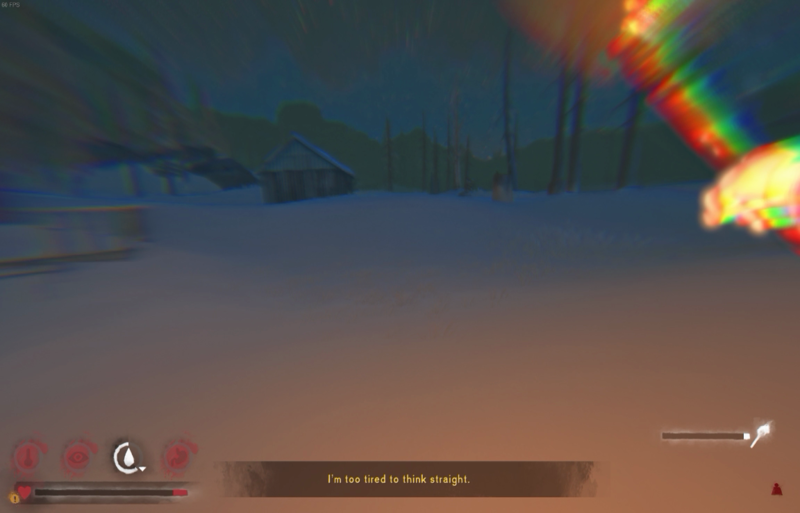 Not so lucky this time around, I don’t even get past the orchard and a wolf is coming up on me. I throw the torch and light another to see if I can walk the wolf over the lit torch and scare it away. 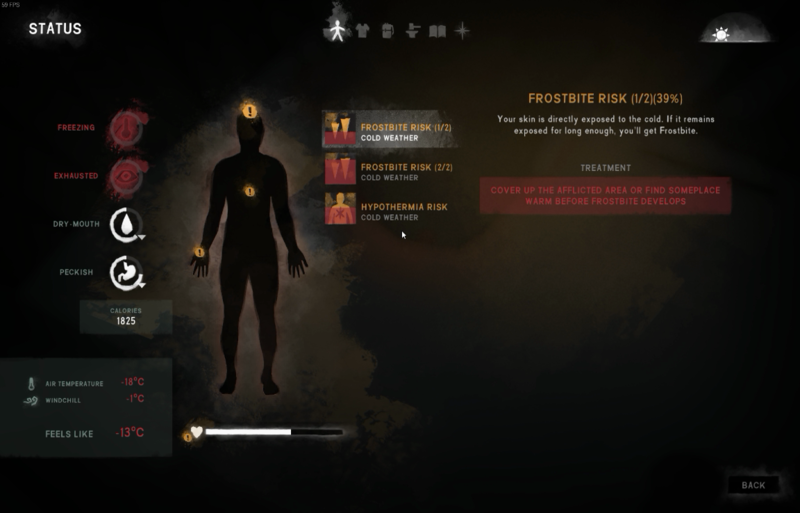 It works but the wolf charges in my direction however it is still hurting from getting her toes burnt so I escape without a struggle. 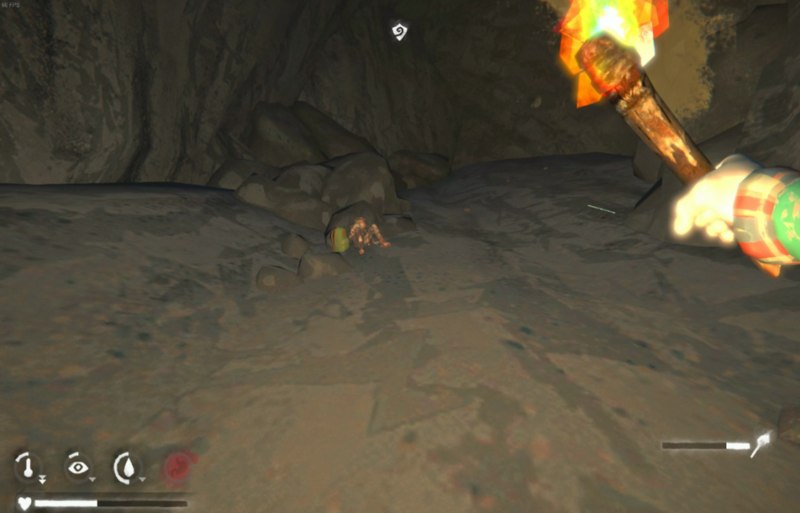 Instead I decide to try the other direction and find a clear enough path to the broken tower cave. Lucky enough to find some four coals has fallen down from the ceiling as well. 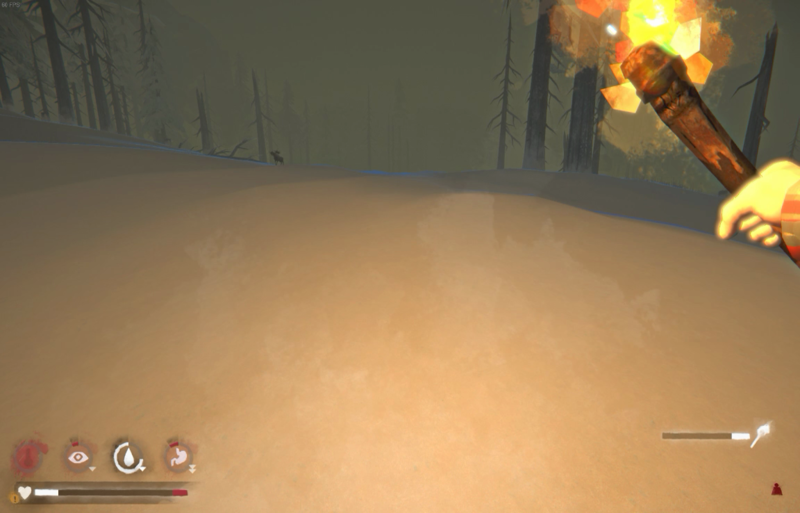 I drop the hide and make my way back. Salty crackers and a cat tail for me tonight. Fantastic progress! Rocking crafted clothing like a boss. When the game inevitably gets primitive firestarting, challenges like this will get more and more interesting. 3pm wakeup and it is a clear day but I can hear the wind is still blowing hard. 3hrs 41min left on the fire for the afternoon will keep me warm. I start today at 67% health up from 35% overnight and yesterday – I would like to get that up at least a little bit higher to be safe. It starts out at FLT of -12C but within a few hours it warms to FLT of -3C. 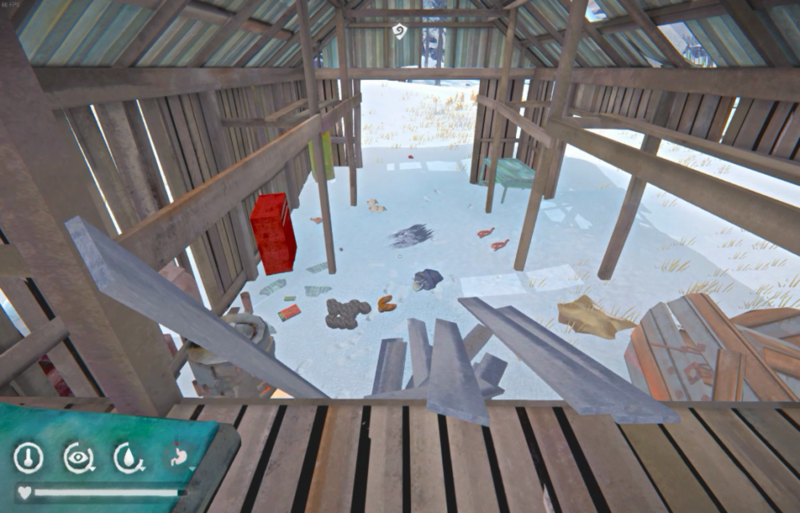 I break down shrubs and crates by the dock as I cook some water up. Where should I wander and collect sticks today? 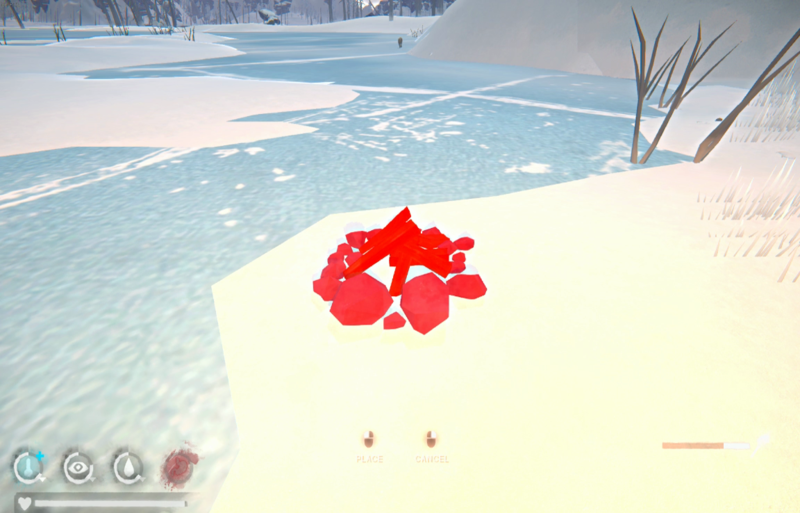 I cross over bear island and find some still untouched cattails, a welcome sight as my stash is down to about 15 left, I refill to about 31. 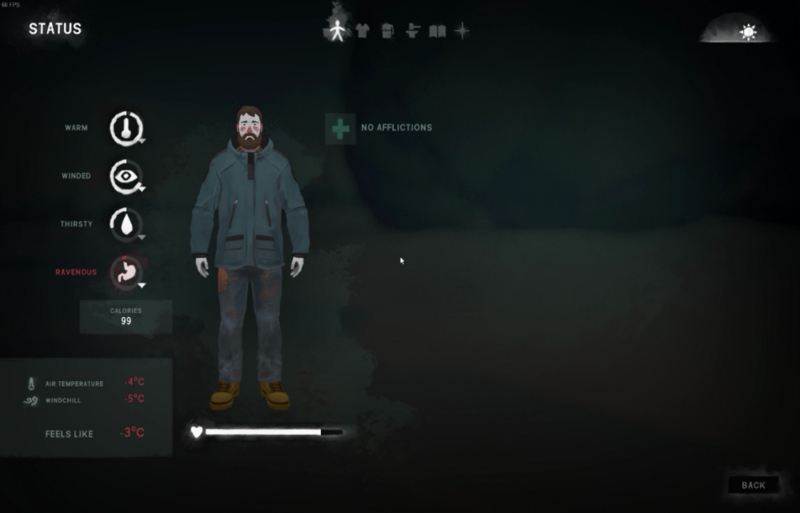 I skulk over to the low blind trying not to draw attention of the neighborhood wolves and find painkillers there which I believe is a guaranteed spawn in FM. 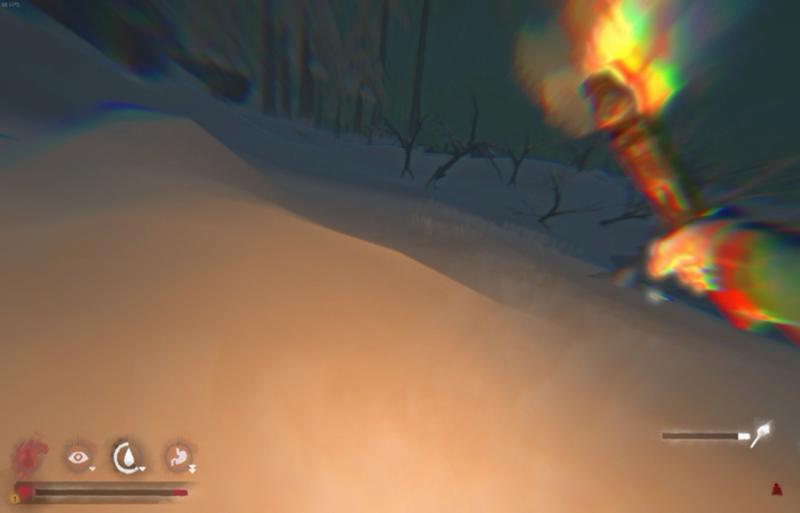 By now I have loaded myself with 95 sticks as dusk falls. I set a campfire split between 2 cedar logs and brew a tea to warm up. After breaking down the cedar and stoking the fire I collect stick in the area and build up to 106 sticks and 3 cedar. I break down the other cedar for 3 more with my hacksaw down to 19% but I am now so loaded with wood I am overburdened. Not a bad problem to have in FM but the route back could be getting a little more perilous as the fog has come in and I can’t see more than a few feet in front of me. Likely walk straight into a wolf on the return trip. It doesn’t take long as I am following the edge of the ice that I get a bark not too far away. I quickly drop a fire and scare it away from me hopefully in the opposite direction from where I want to go but with the fog I can’t be sure where she has gone. A few more sticks and reishi on the plateau above the BR train and across the double tree bridge. Thankful for a quiet run all the way past the broken tower and down to Spence’s. If there was a wolf or two there I didn’t see or hear them. Made it back at about 55% condition and 14% hypo, surveying the barn we have a good surplus of fir logs, coal and a pile of sticks the envy of any Mystery Lake Camp Office hoarder. 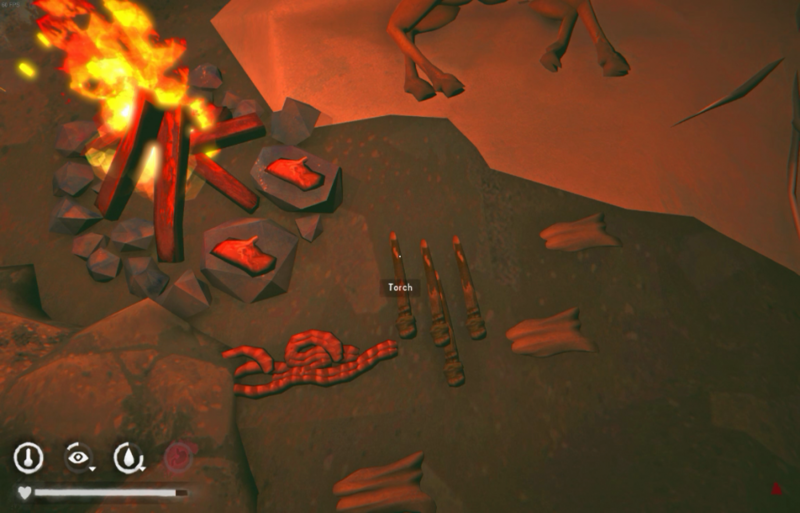 I even had 105 stick in the backpack here so that is really good shape – a 9 hour 20 min fire leaves me with 39 for tomorrow plus that big pile on the ground. 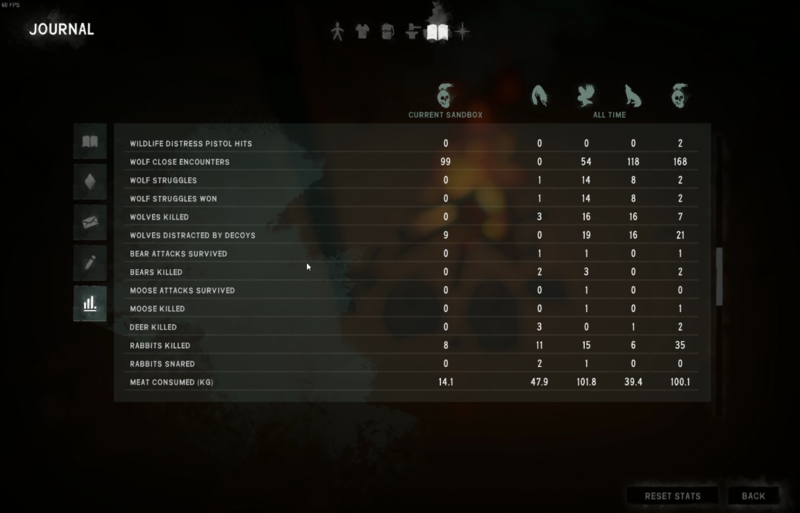 A full 10 hours rest has brought me back up to 84% health. 2 hours 4 min left on the fire as I’m up around 2pm in the afternoon. Thick fog again this afternoon, I’m not minding the weather temp wise but navigating and taking safe routes is a challenge when you can’t see where you are going or rather what kind of animals might jump out at you. 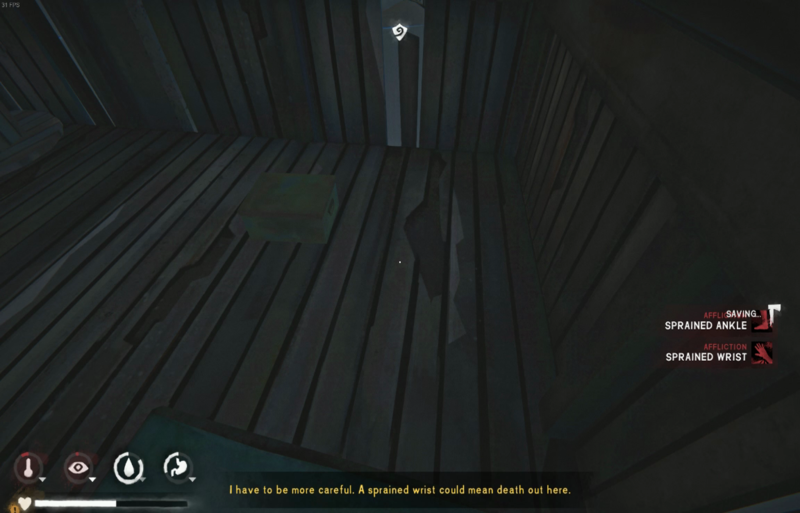 I go and break down a bush by the bunkhouse dock with the fire on of course I leave without a torch. On my way back though a wolf barks at me near the orchard and I have to take a wide berth around the carnivore and then sprint back. The fog thankfully has lifted slightly but the wolf has taken an interest in my barn home. 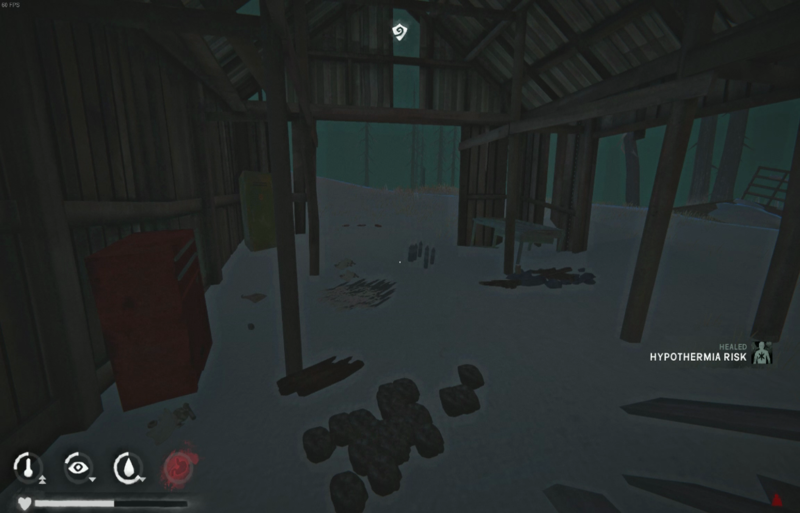 I lure her in to scare her back to the dock area with the forge fire, or is it just the barn that they run away from? FLT is -6C, it’s getting close to golden hour - time to go out for some more scavenging. 3 deer have decided to join me at camp and an aurora is starting up tonight as dusk falls. 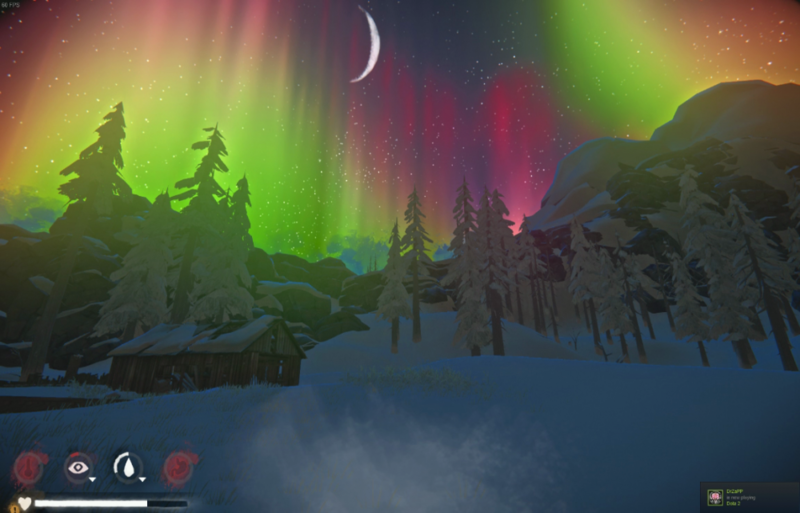 Maybe we won’t be venturing too far away from camp tonight with aurora wolves that much more aggressive. I stay close to Spence’s collecting sticks by breaking down scrub bushes tonight. I am careful to always find the leeward side of the bush and save on the extra wind temp negative. 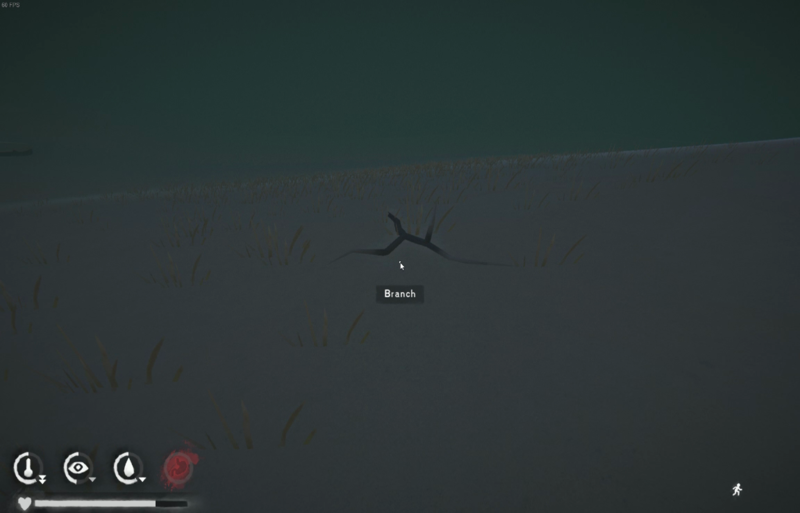 I have found that there is always one side of a bush sheltered from the wind and I make sure to crouch on that side to break it down. I’m not sure how much it will save of your temp meter overall but it probably allows for collecting some extra sticks each trip out depending on the FLT. What an amazing aurora view tonight with a small sliver of moon. 98% condition, staying around camp last night really helped to maximize healing. The 3 deer are still around but I have more visitors as there are now two wolves down by the dock. Let’s dance! 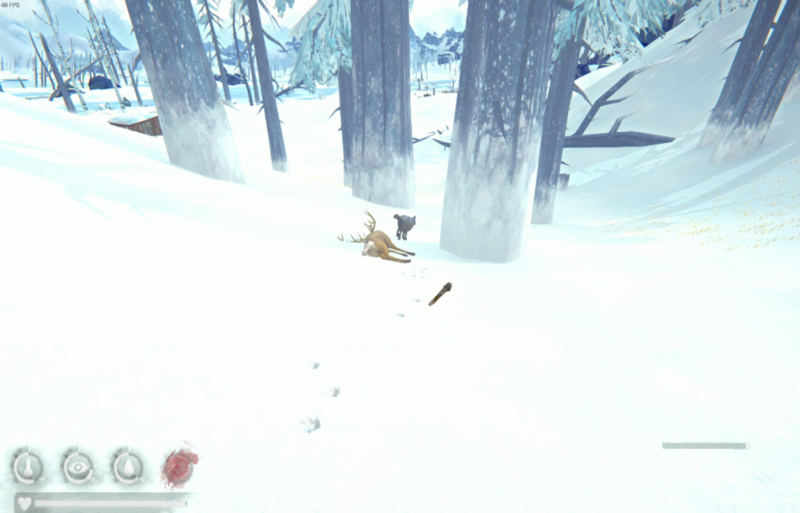 With the smelly bait the wolves are on me a tracking from a much larger distance. The deer are a bit up the hill and I want to move behind the deer but my mistake and I push them farther from the barn. I stay tight to the cliff and am just able to wrap around behind them but another wolf has picked up my scent from up by the broken tower. I quickly drop all my baits 3,3,3,… I scatter the deer moving away from the latest wolf so I didn’t really get a good chance to create an angle with them. I am successful with the improved odds though as one of the three runs back down towards the barn and right into a fluffy fur ball. 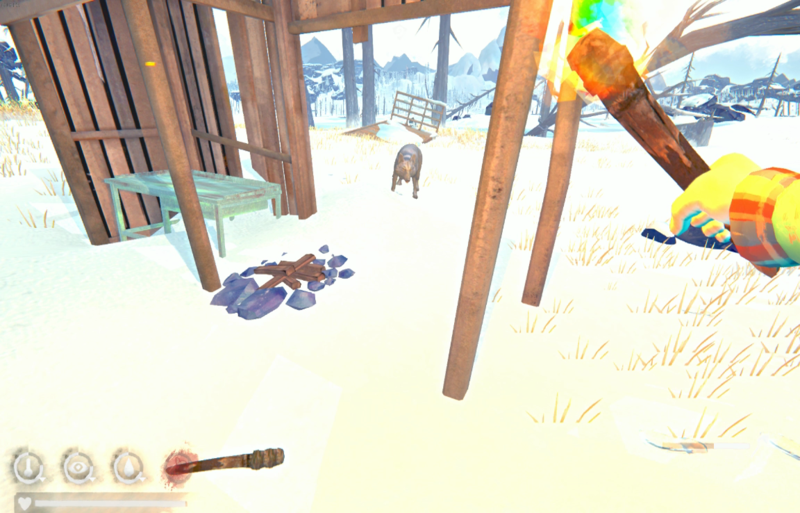 I build a safety fire a short distance from the wolf as her back is turned to me devouring my meat! I pull and torch and toss and off she goes. 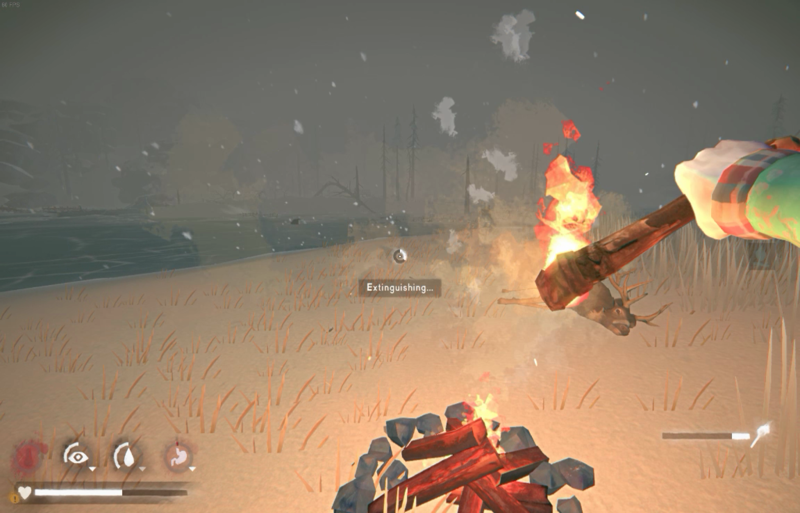 I set my harvesting fire just down slope of the carcass and start to cut steaks to cook on the fire. 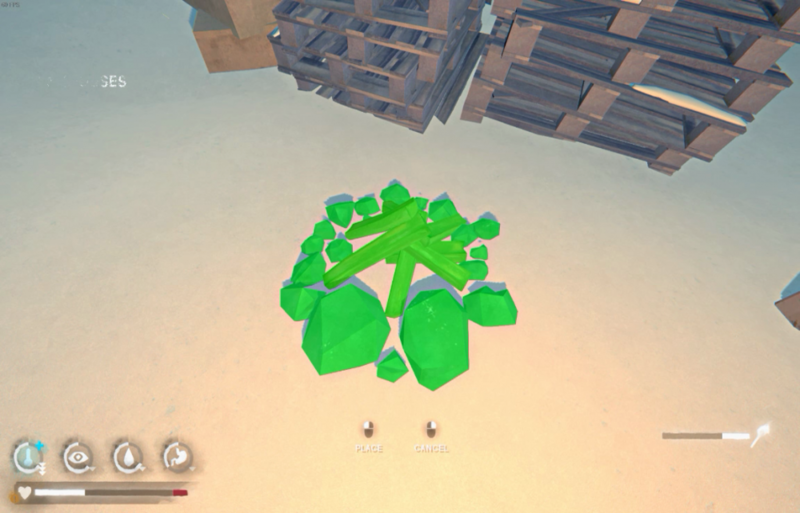 My total fuel load was only 21 sticks and 1 coal so I have to make a fuel run before I can completely harvest this bounty. Even though there is all this meat, guts and hide close by the priorities are still sticks and logs. I set up past bunkhouse cave near 2 bushes and break down branches in the area as well as collect loose ones. My stamina is not all that high so I get overburdened with only 80ish sticks and decide to head back. I notice I have 4 matches left, I can’t recall the last day that I used a match but it’s been a good run of continuous fire. 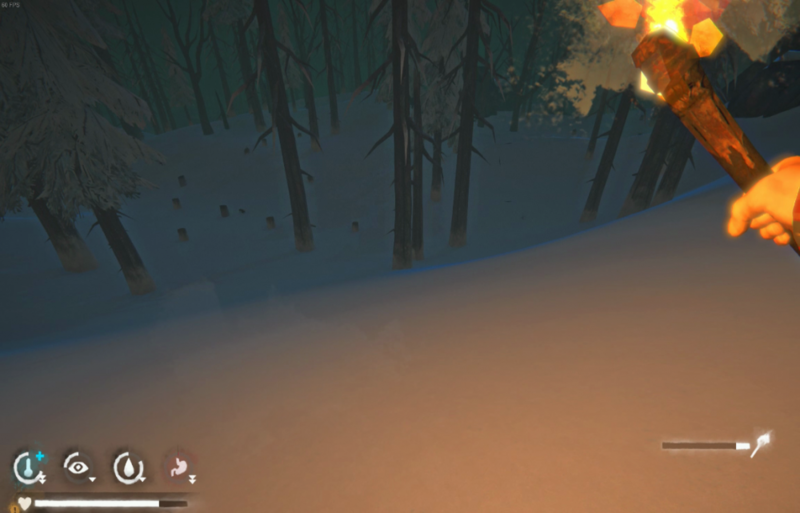 I think I had a torch blow out on the run up to Marsh Ridge to pick up hides around day 15. TLD doesn’t track the fire length transferred to torches though so Keg 2 has a longest fire of 40 hours if I remember correctly. 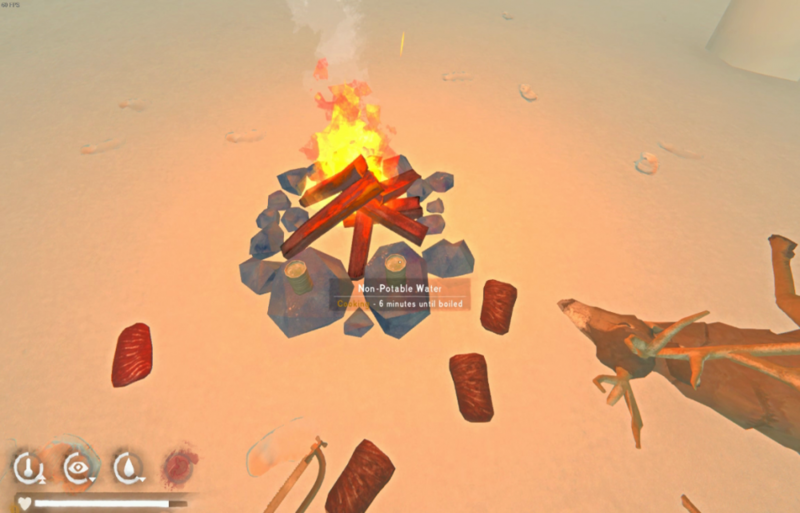 Total fuel right now is 8 hour fire, 64 sticks, 6 cedar, 2 fir, 20 coal. 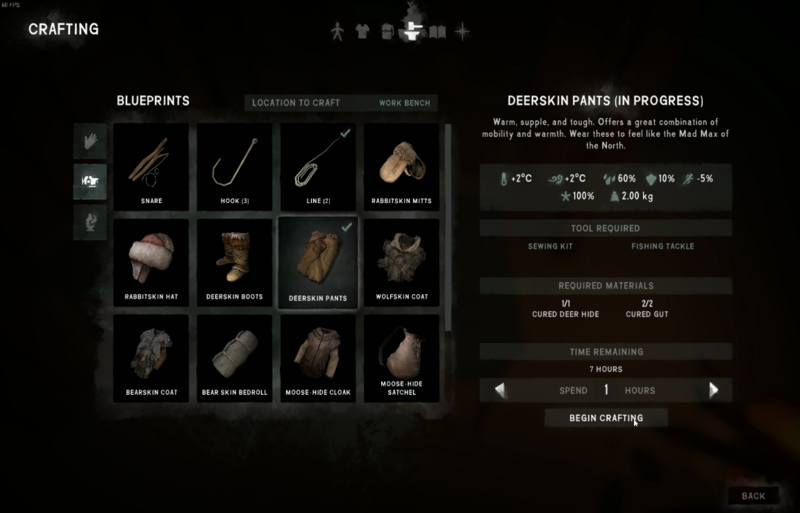 Still short 1 deer hide for my pants. I could make deer boots but my actual work boots still have decent condition and a pretty good warmth bonus. Couple more cups of water made and I head to sleep for 8 hours. Start the day at 94% condition. 2 hours 40 min left on the fire. 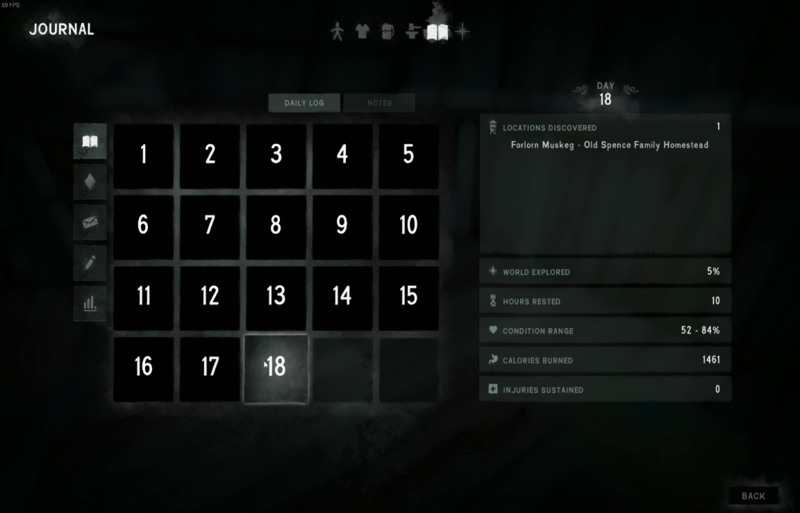 There is a wolf somehow glitched into the broken Spence house and it is growling as I walk by but I don’t see it in the rubble. 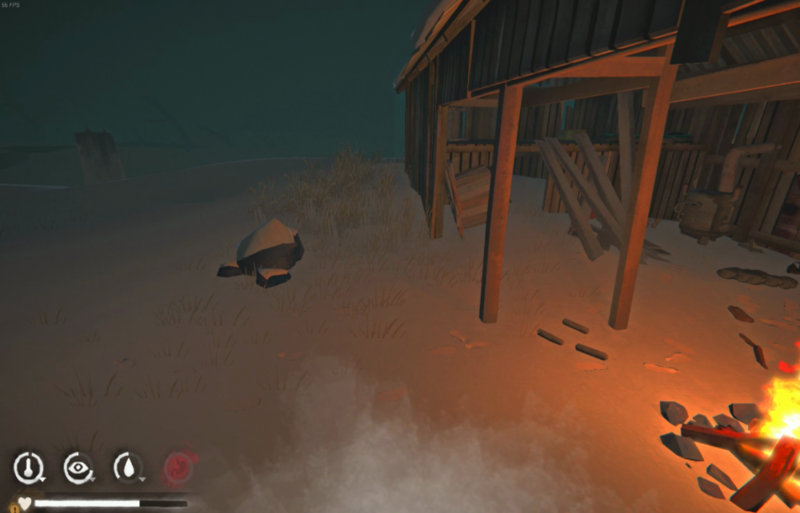 A second wolf appears from the direction of bear island and it bounces off the barn and runs away. 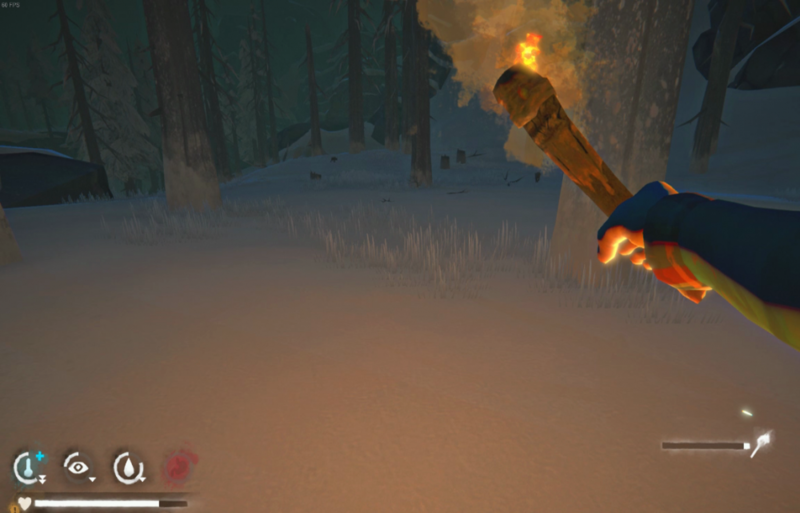 I collect a torch and make a quick run over to my previous kill. I pick up 5 X 0.5kg steaks cooked that I had left there previously. 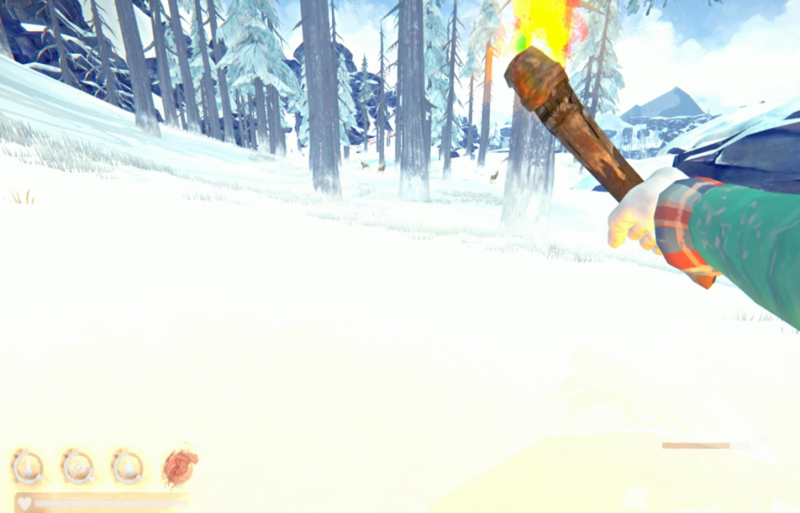 I warm a tea and take 6 torches to drain the fire. Wolf follows me for some distance from Spence's. Past the train and Low Blind I collect the bounty of sticks below Marsh Ridge and run into the abandoned campsite in the direction of Hat Creek. Prybar is useless to me, two fir logs and cans of pork and beans (4%) and sardines. No snow shelter here, perhaps it has already deteriorated. Crows over head near the mouth of the creek signal a deer carcass. 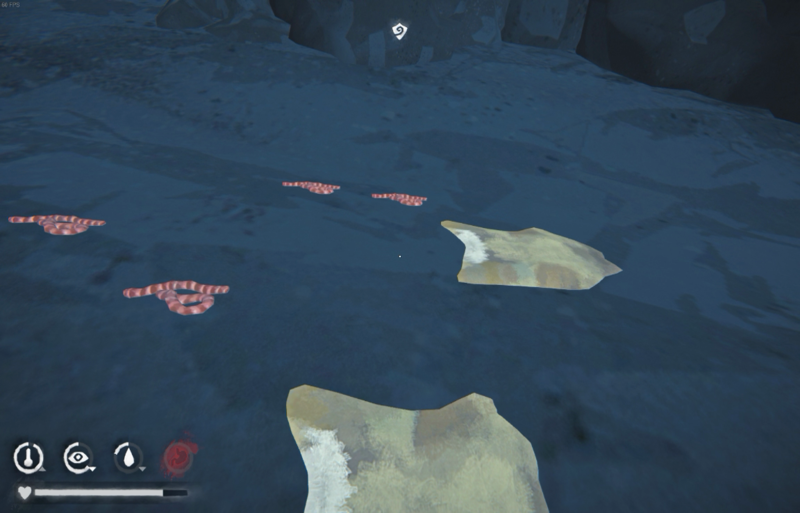 I harvest everything but 1 gut and move on to the cave. Two cooked steaks await me when I get back to the fire. Cattails, rosehips and sticks all the way back to the barn. Return with 110 sticks. A 0.5kg deer steak and 2 cattails and I’m off for a 10 hour nap after a slight scare with a wolf cresting the hill just before getting to the barn. My jaw is still dislocated in awe. Same here. Permafire eh? This is actually a viable strategy if you got the guts to travel around unarmed, I'm still amazed at how you can torch travel safely avoiding the wind and the predators. Hats off, sir. I am really noticing the burn time improvement of Fire Level 3. In another run I may really try to push for Fire Level 5 early on and see if I can stretch the fire length out to the max. 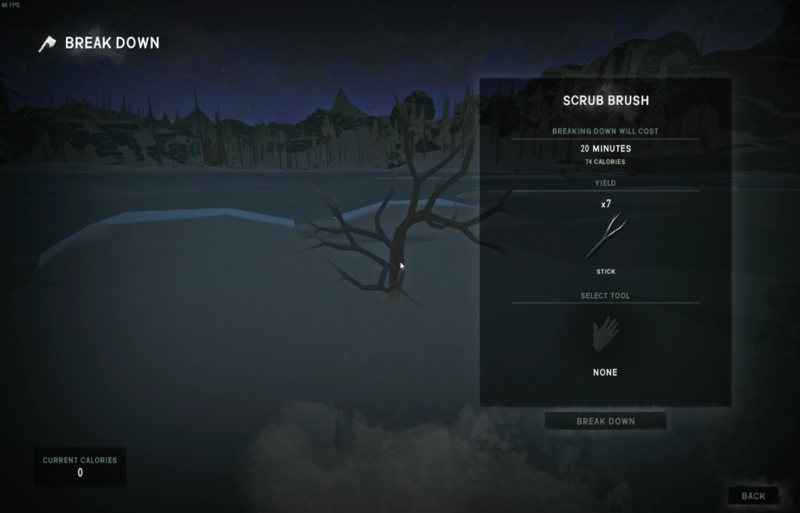 There are so many sticks and bushes in FM that I pretty much have a 3-4 day rotation of collecting where I can travel out, build a fire and keep that fire running for 8 hours with local area sticks then haul back around 100 sticks or more. 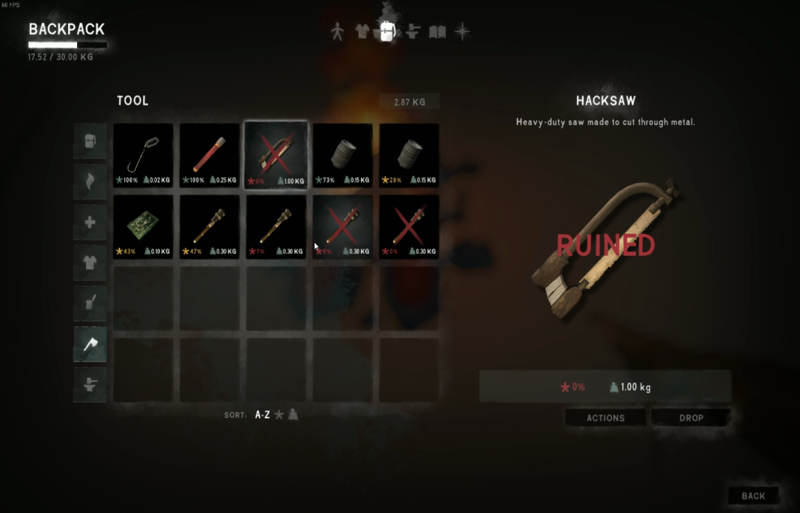 I'm kinda bummed my hacksaw is broken now and I'm excited for a redo where I could maybe find a hacksaw with a tool box bc there is so much scrap metal useless to this survivor except repairs of the hacksaw would allow me to cut more cedar and fir logs. Weather has been phenomenal in this run. Perhaps the FM default is for not such high wind level?? 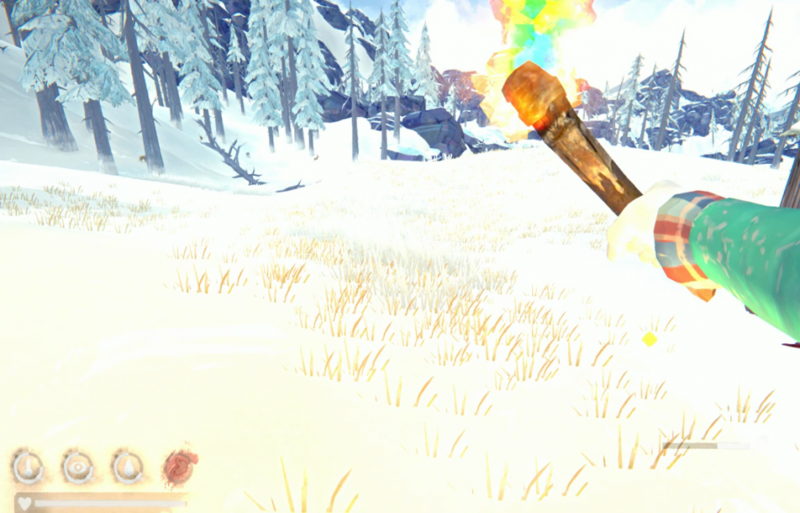 Of course if things looked bad I did stay home and nurse the forge fire. Outside fire bonus of course is key and with the weather temp coming down I am actually finding it easier to stay ahead and even stockpile more wood. Coal is a super bonus too as there are at least 5 caves producing coal and they are all within easy-ish reach. Looking back to my 8 matches used in Day 1 to Day 15 I'm not sure if this was just needed for the setup time to get in the groove or if another run would make me more efficient right from Day 1. 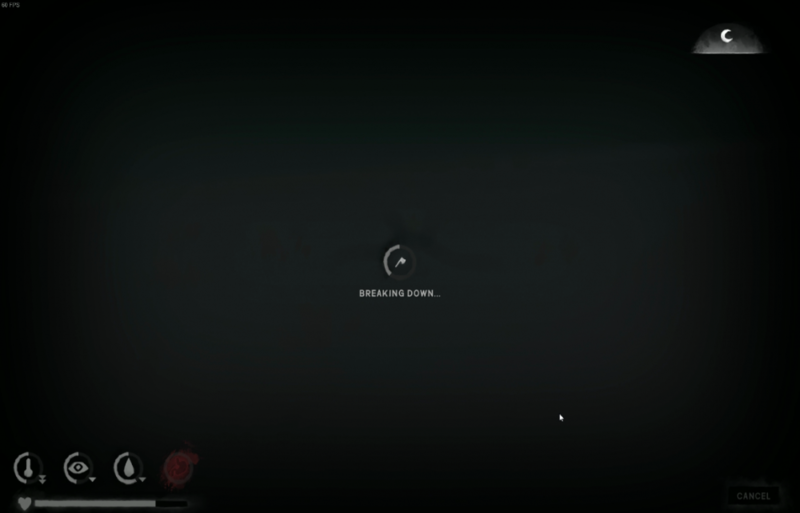 There are rumors of a Mag Lens spawn in FM so that may be key to an even longer run. Torch travel is key here. 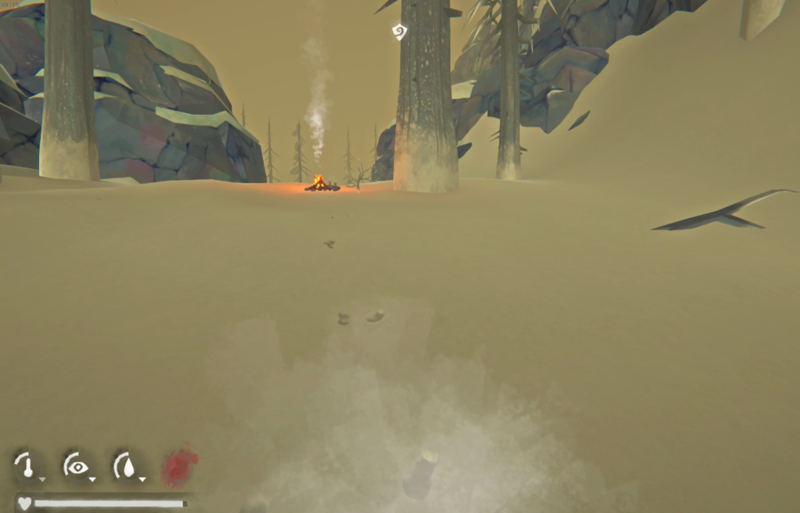 I'm not really worried as I can just drop the fire if I get into a tight spot with the wolves. 10 hour fire last night has 4 hours 4 min left at wake-up. 100% condition. 42 fires started with 8 matches, 4 blizzards survived. The wind tells me I might be in for a fifth. FLT is -31C. After an hour it up a bit to -18C and I go out for some short runs to pick up sticks. 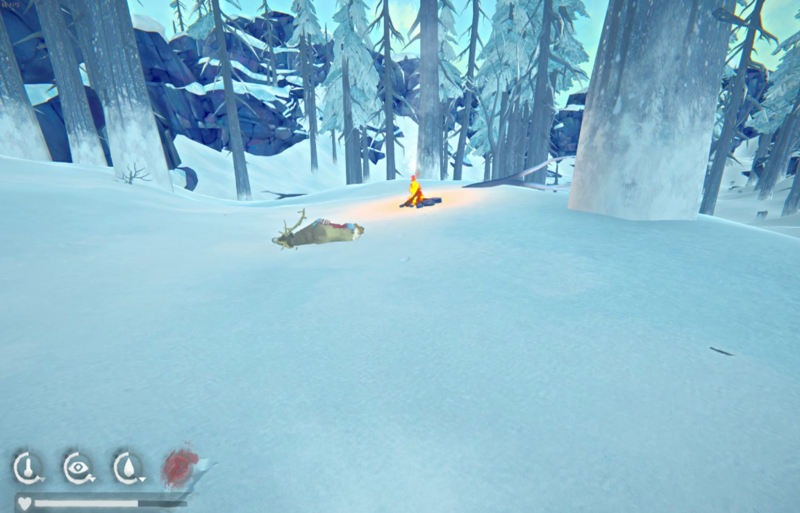 My camp has become infested by 3 wolves in the short time away. I have to take a long circular route back to the barn. Lucky I approached from the hill above and saw them before they saw me. I planned to go to Poacher’s today but that route is a no go so I decide to go to broken tower and the double bridge to collect fuel. After that it’s on to Low Blind area in the fog. It’s a rich bounty of sticks in this area although it can have it’s own wolf problem. Sprained wrist mountain goating up to Marsh Ridge, nothing a little sleep won’t fix. Too bad I won’t be able to take down a couple rabbits on this day. There are still a few more reishi up here and the weather is holding very nicely. 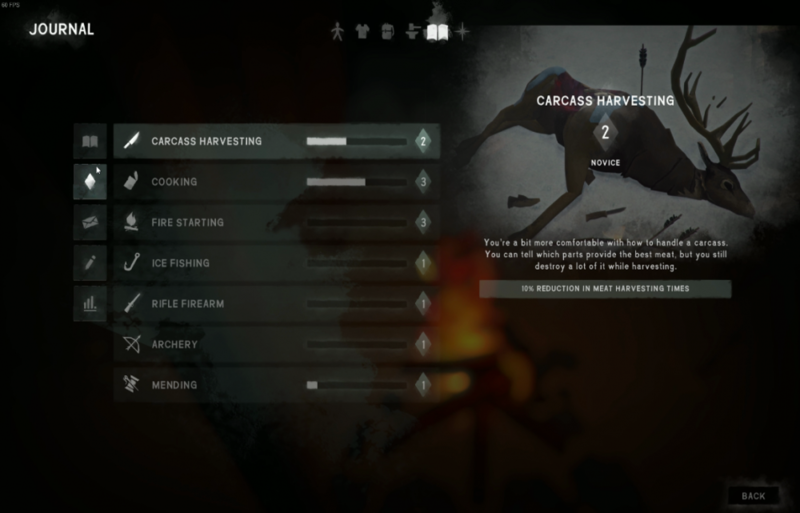 I set a fire by a carcass and warm it. 2.2kg available is one of the better ones to find! The second 0.5kg is the end of my hacksaw. 19% and broken so it’s lifespan didn’t stretch out much. 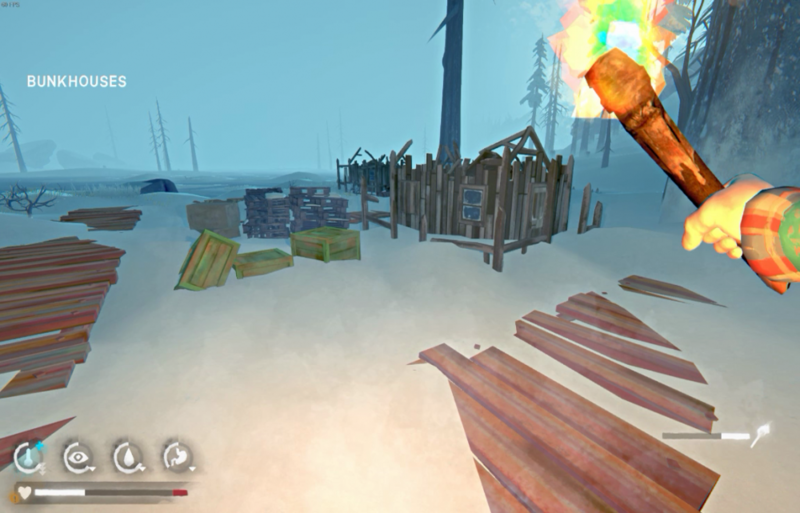 I’m mostly sad that I won’t be able to saw anymore large logs on my collection runs as they are great warmup locations. Marsh cave yields a few sticks and 3 coal. 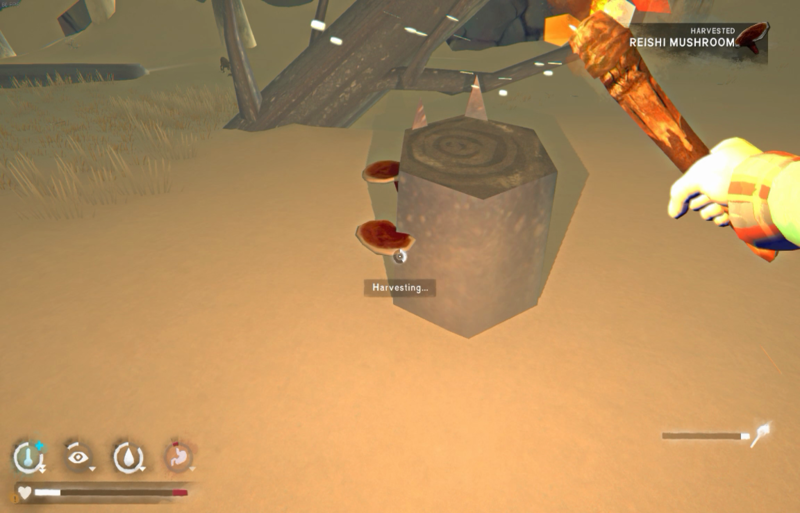 I now have a stockpile of 5L of water and I leave the lantern each time here at the entrance. No need to carry that heavy thing back and forth to my bed. 20 more sticks collected after taking 1 of 2 guts and temp meter is zero just before getting back to the fire. 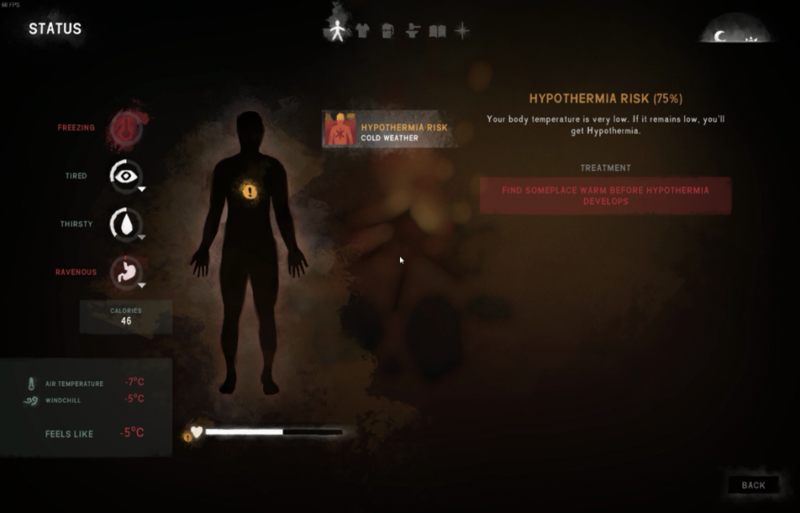 Harvesting the last gut brings my warmth all the way back up. FLT now down -21C around midnight as I make one last run to the cave to drop guts and hide for curing and add 2L more to the water stash. I’m usually overburdened walking back that I can’t afford taking the water with me too. Reishi to warm up, 49 minutes on the fire I take all that as torches for the walk back. 4 steaks in the backpack are going to attract some attention for sure. As soon as I drop off the ridge I hear growling from my left. I maneuver to the right but then confront another in front and the first is behind me. I think about lighting a fire but it usually helps more if you know where they will run off to. I manage to split between them and then catch a glimpse of a third wolf following on the trail of #2. 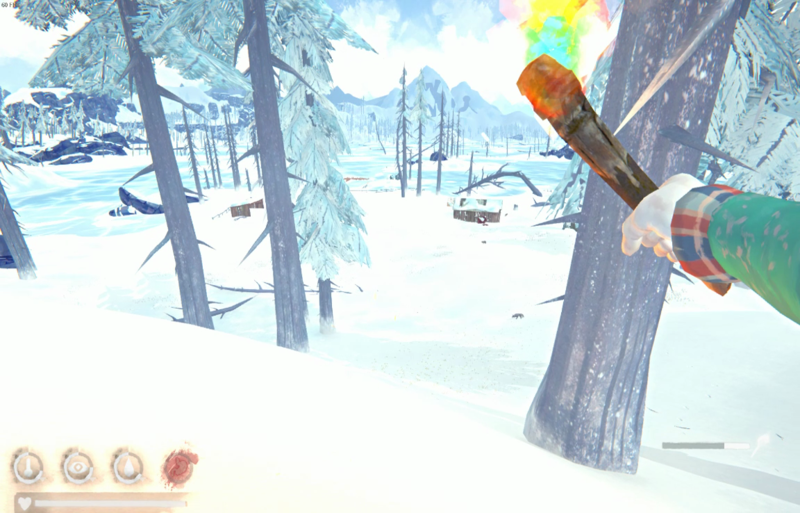 My torch is getting low and I quickly do a switch and drop off a ledge in view of the train cars. Safe, for now, but I will have to rethink that route back from Marsh as it is always a bit hair raising. 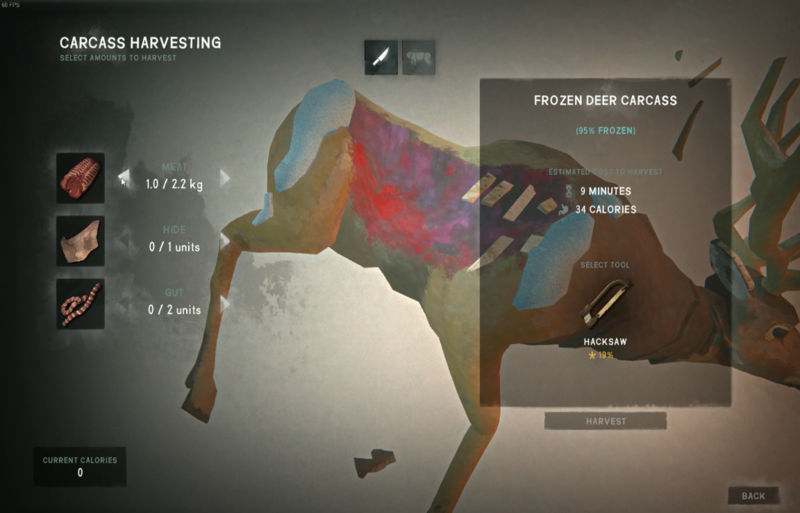 I want to collect the deer hide from the cave on my way back; it was at 88% earlier so it should be just about time. I eat one steak before the tower but it doesn’t help me from attracting the attention of the wolf there. 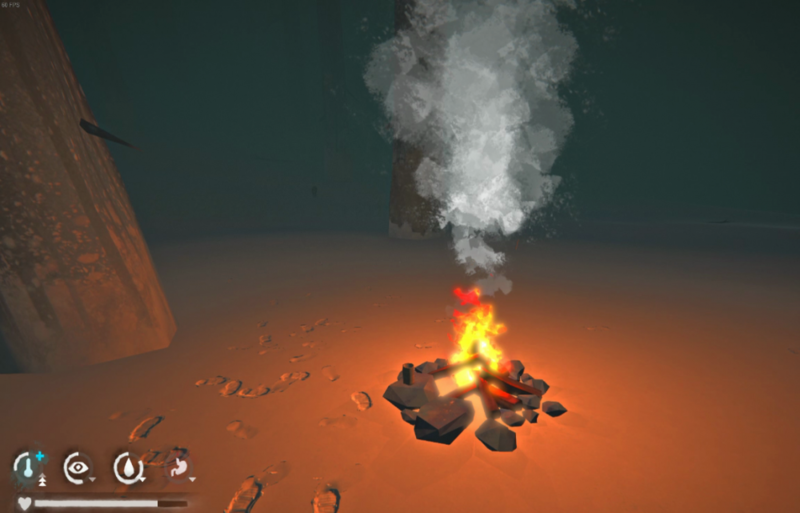 I take an untested mountain goat route to avoid her, worked out pretty well and I get to the cave entrance and start a fire to scare it off. 99% on the hide, just a fraction too early. I start a fire and cook some reishi, water and craft some more teas waiting for the final 1% to cure. Back to camp and 9 hours on the furnace. I sprain a wrist and ankle climbing the board ramp to bed, must be extra tired today. Condition 80%, 3 hours 3min left on the fire. Definitely crafting day today, I need a new pair of pants. 12.5 hours until I have 2nd pair of pants, 43% on sewing kit will be just a little bit short of the total time needed. I am running a little bit low on sticks now though so after 1.5 hours complete I head out once again. Past the bunkhouse and to the moose spawn area it has turned foggy and I can hear wolves all around me howling in the wind. One I can even hear its footsteps in the snow. 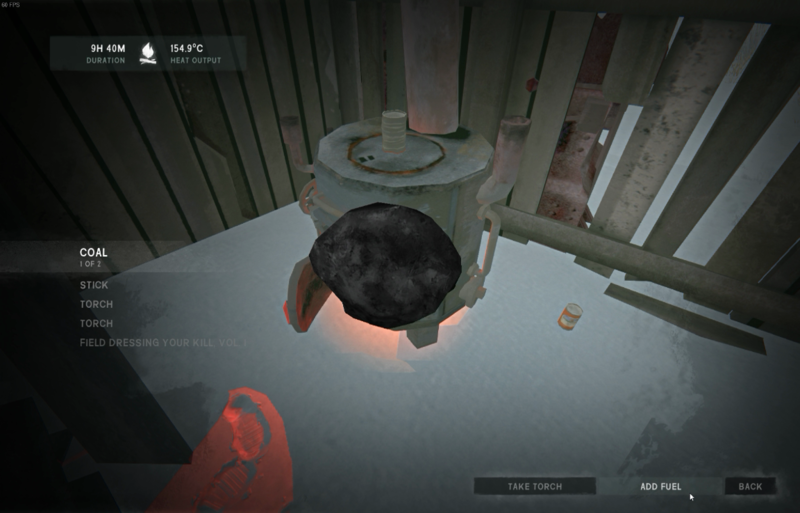 I start a fire and break down some branches until 30min hits and I can add a coal and finally start some real warming. 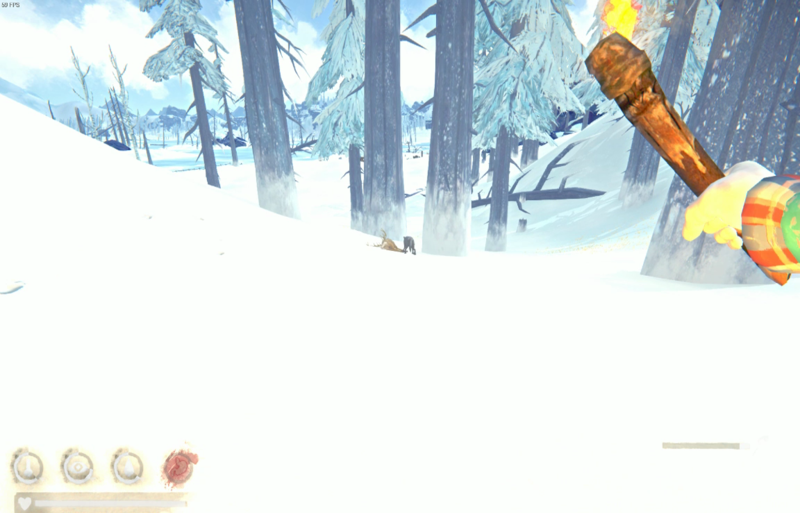 Wolf is around so I crouch down as I break down 3 more sticks. 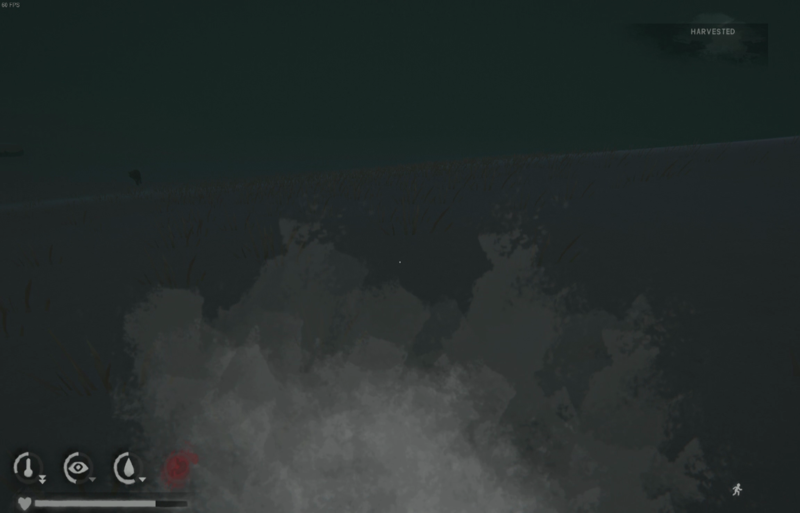 When I exit the animation, he’s right on top of me. I stand up and sprint back to the fire. The fog has lifted slightly as midnight nears and I feel marginally more secure now that I can see farther out. A quick trip to the south cave and break down a bush. I sprint back with the start of hypo and arrive with just 9min on the fire. 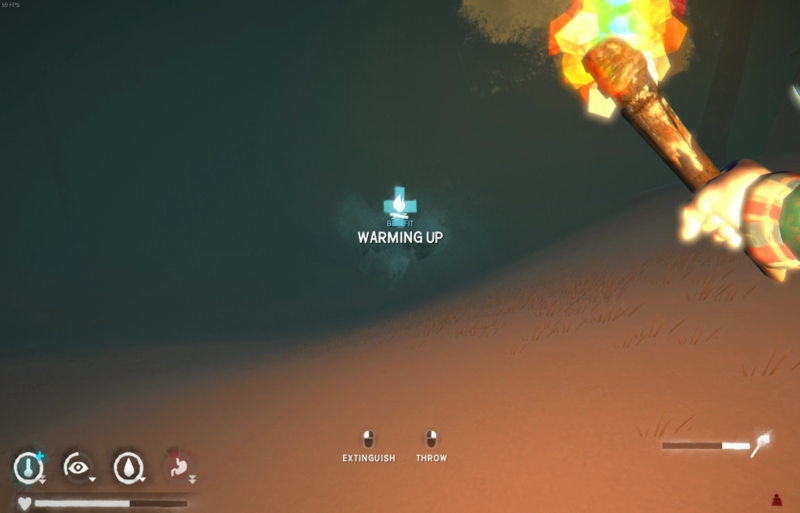 Just about lost a match and all that warmth there too. The path back is patrolled by a wolf so I jockey it over to me in a direction where when it hits the fire it will give me a safe way home. 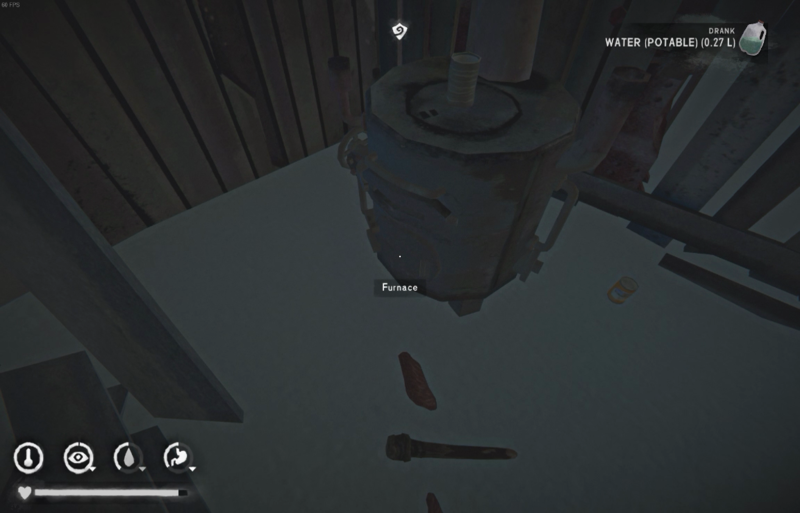 My plan works, but in my haste I pull a torch but don’t pick up my water can and leave it behind at the fire. Another wolf by the bunkhouse and I need to drop another fire but I profit by collecting a bunch more sticks in the area. I make it back with 73 sticks. I save about 20 but that much gives me an 8 hour fire and needed warmth from my 37% hypo and sub 50% condition. I harvest my 8% socks (currently +0.0C bonus ). I craft another 0.5 hours on the pants as the sun rises, time to turn in. 2 hours 26min left on fire, 78% condition. Out doing short runs for sticks. Wrist sprained again walking on a side hill, seems like I am having a bad run of these. After the fire dwindles to 40min I take torches and restart fire next to the workbench. Always foggy this time of day. One advantage will be double cans making water. 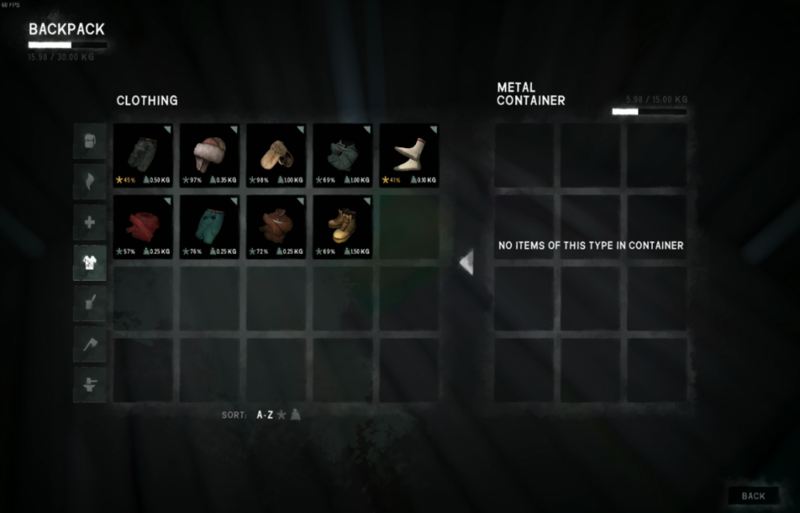 I start crafting with the sewing kit, I should be able to get all but 3 hours or so done before needing the fishing tackle to finish. 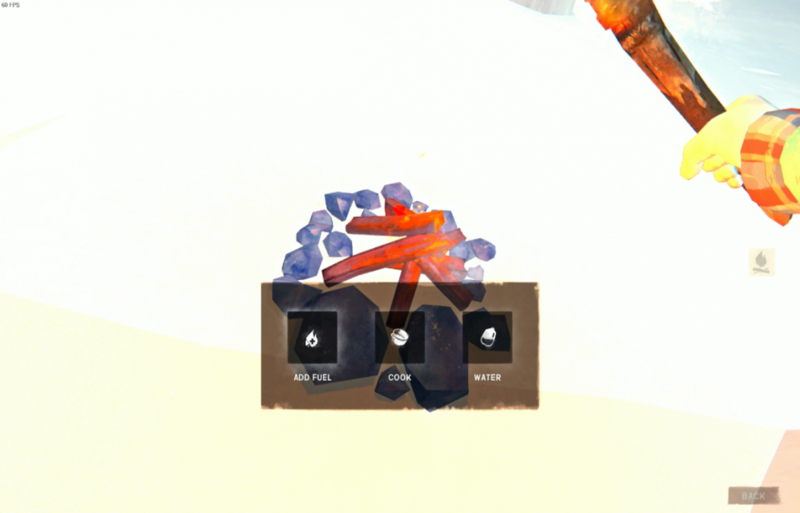 Fire level 3 achieved is a nice touch, a good bonus too for this continuous fire requirement. 6 hours left on pants 11% sewing kit. 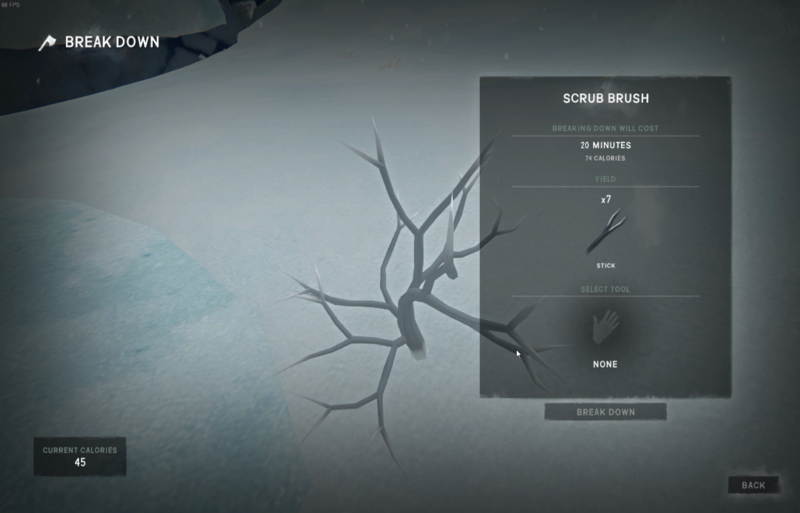 I craft until early morning alternating breaking down scrub and sewing for an hour to warm up. 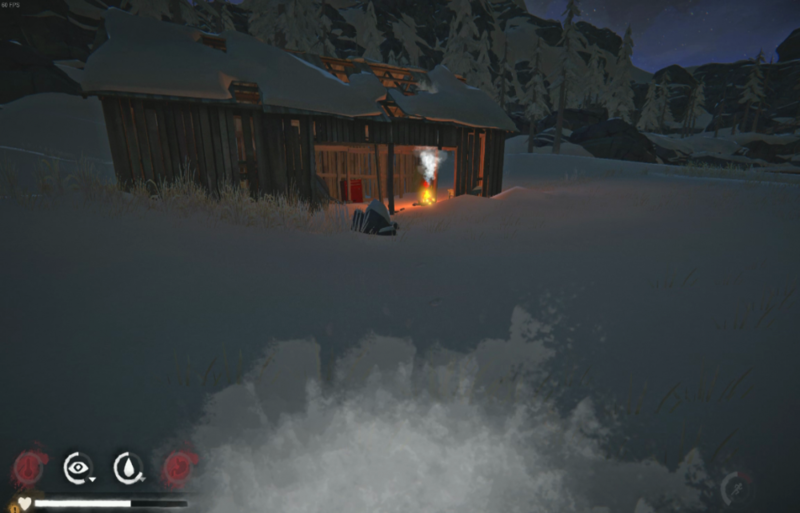 I transfer the fire back to the forge and prep for sleep. 9 hours 2min on the fire and off to bed. 0.5kg steak, 2 cattails and a drink of water and 10hours in bed. "Wolf Close Encounters: 99". Yep, this is really not for the faint of heart. Impressive run. Gooner, I'm enthralled reading this. Thank you for the plethora of fine screens as well. Can't wait to see how #2 fares as time wears on.